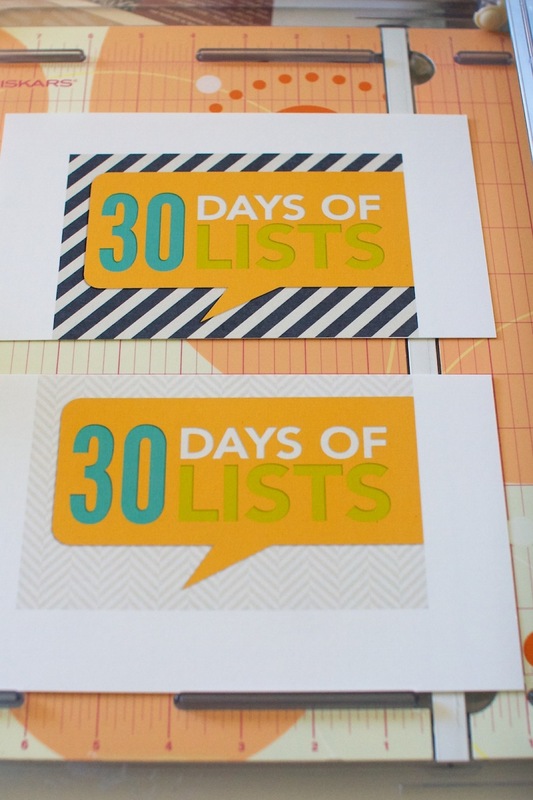 I’ve known since I started this Creative Adventures project last May that one of the adventures I wanted to include this year was 30 Days of Lists. 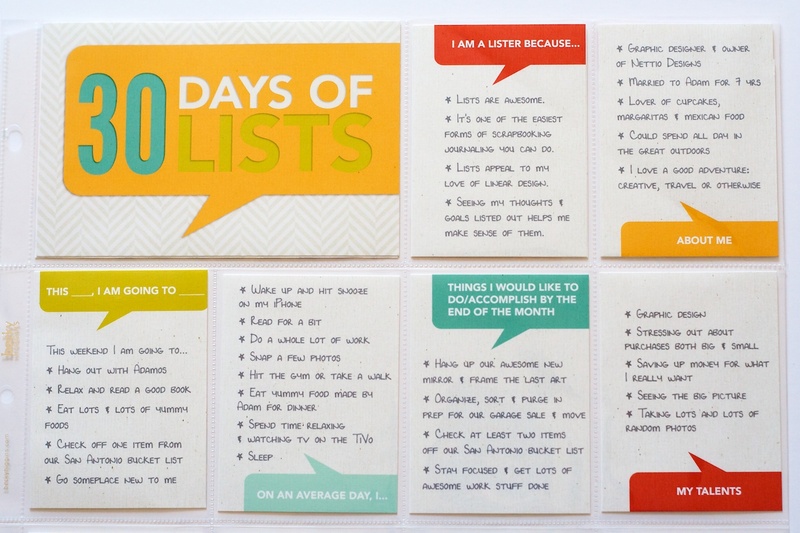 If you haven’t heard of 30 Days of Lists before, it’s pretty much exactly what it sounds like it would be. 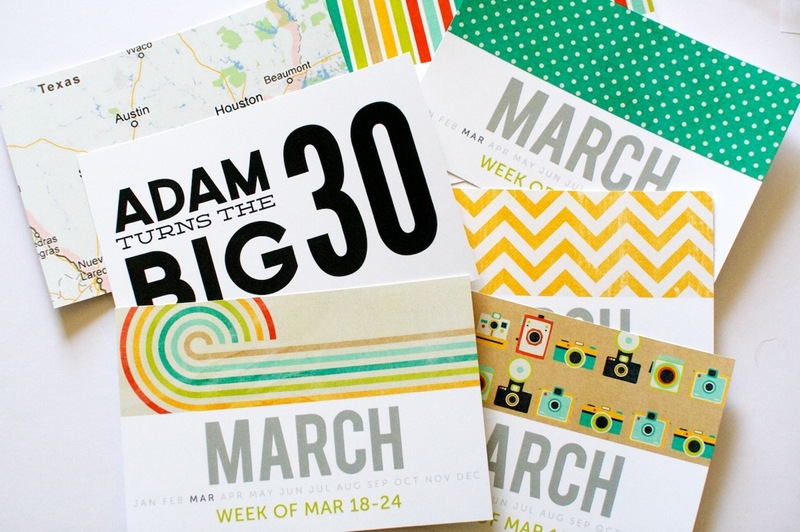 It’s a month long event hosted by the lovely Kam of Campfire Chic and Amy of Lemon & Raspberry. 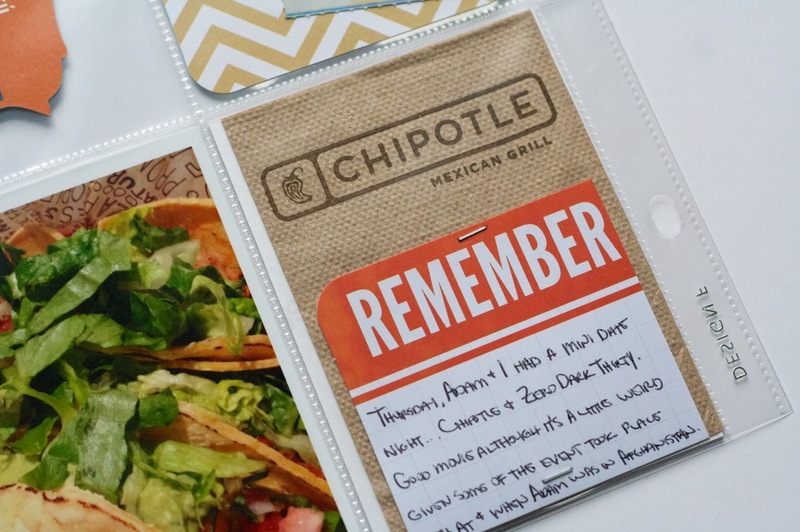 It costs $8 to participate and then every day during the month of March you receive one list prompt posted on a private blog, covering anything from weekend goals to celebrity crushes. 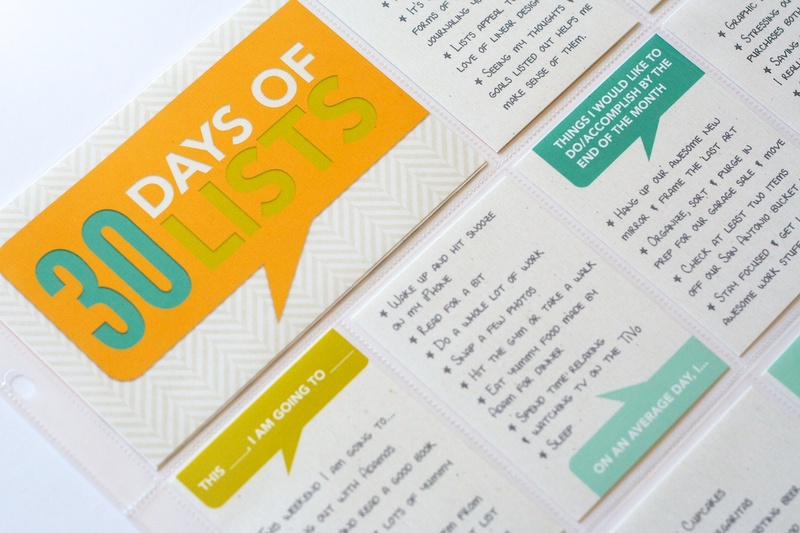 At the end of the 30 days you’ll have a collection of entries capturing a snapshot of your life right now. 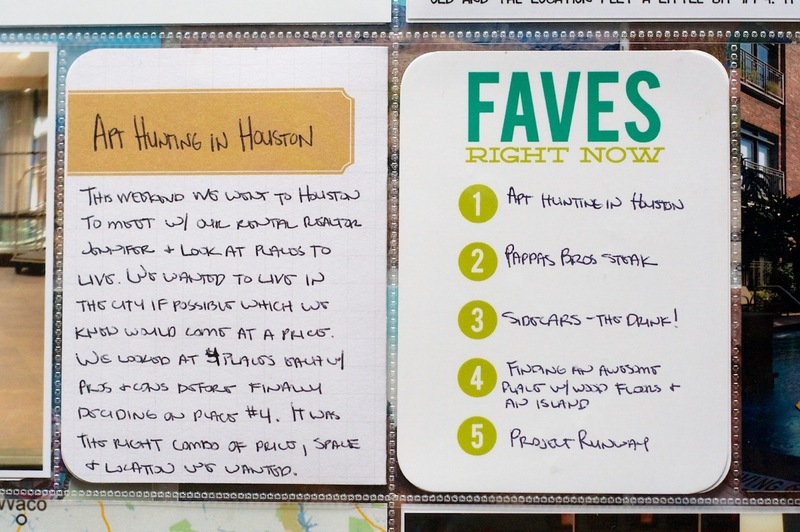 Let’s be honest, a project featuring lists that captures a snapshot of my life right now? You know I’m all over that. You can see my all my completed pages here: #1-5 and here: 6-11. I LOVED how the pages turned out, but I only ended up making it through about Day 11 and I can tell you right now why: because as much as I loved my pages, they were too complicated. Too many details and decisions needed to be made for each one. 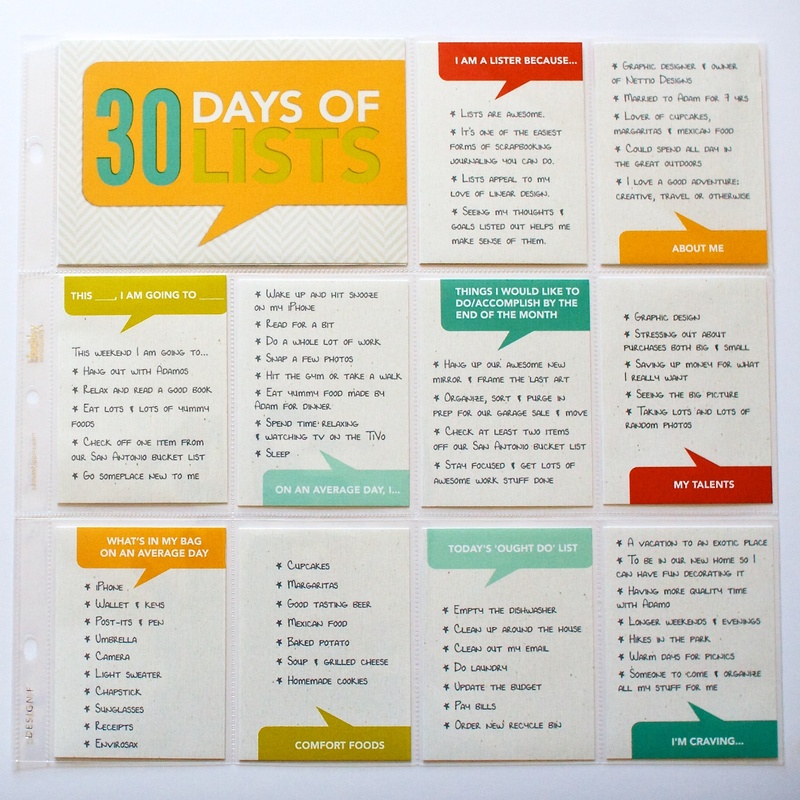 So for 30 Days of Lists, the March 2013 edition, I decided to keep things super simple. 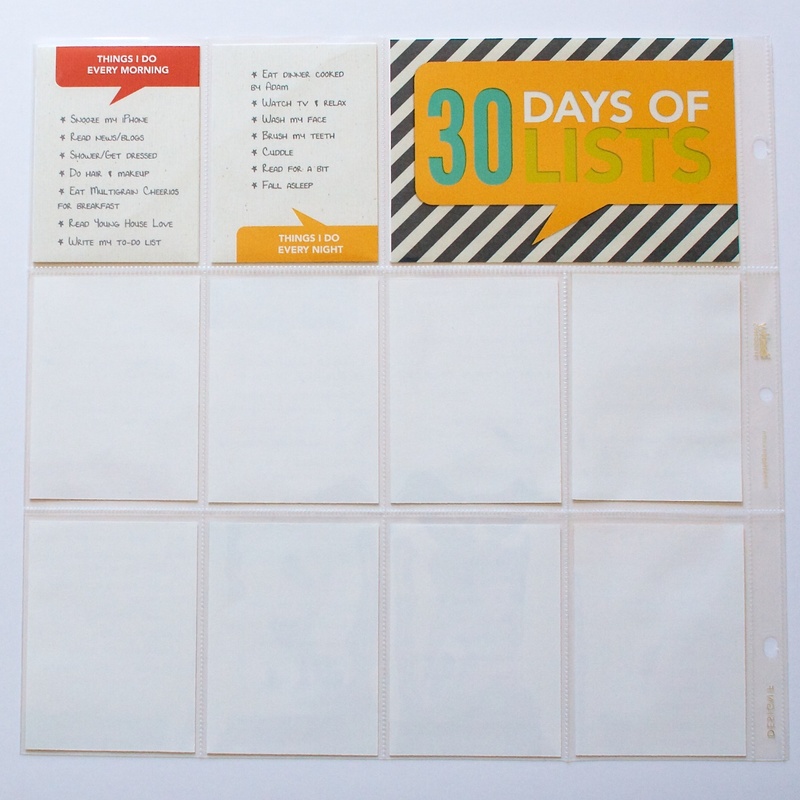 And since I’ve been enjoying Project Life so much, I decided this year I’d include my lists as 3×4 cards as part of my Project Life album by including them in a series of Project Life Design F page protectors. 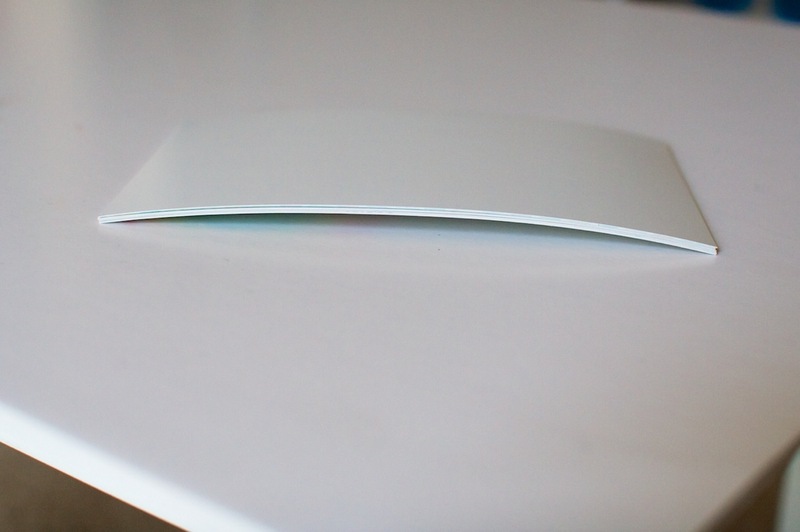 I started by designing a mock-up template in Photoshop and then printing it out to check the sizing of the type. I almost always start with a mockup when I know I’m going to be design multiple copies of something since the last thing I want to do is design a bunch of cards and then have to change them all. I designed all of the talk bubbles using the shape tool in Photoshop. Once I was happy with the overall design, I started playing around with colors and papers. 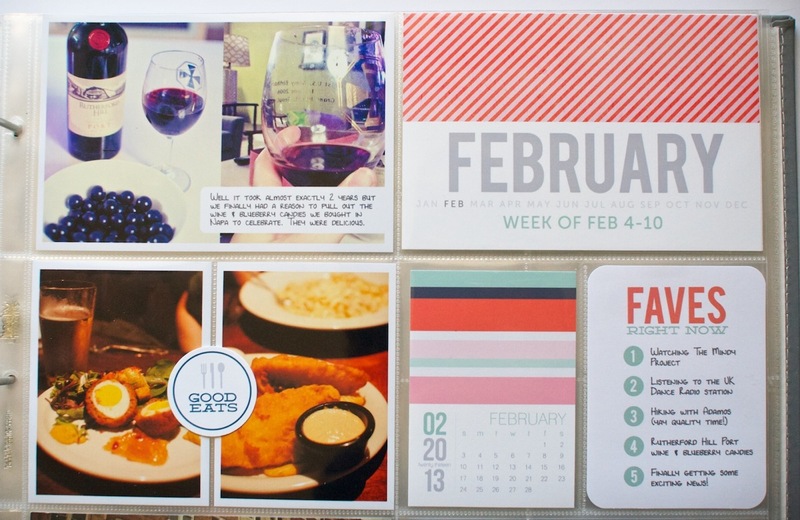 Since I knew I wanted to tie my color scheme into my March Project Life pages, I chose to use a background paper and colors from Libby & Shawna’s Oh Snap! kit which I plan to use for my March Project Life weekly title cards. I also printed a couple of title cards to use in the 4×6 slot in the Design F page protectors. 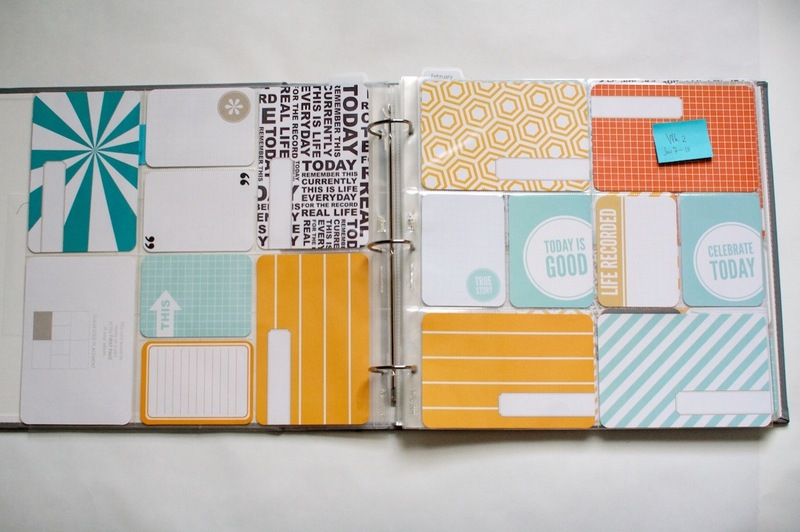 All of the patterned papers for these came from Libby & Shawna’s Oh Snap! kit as well. 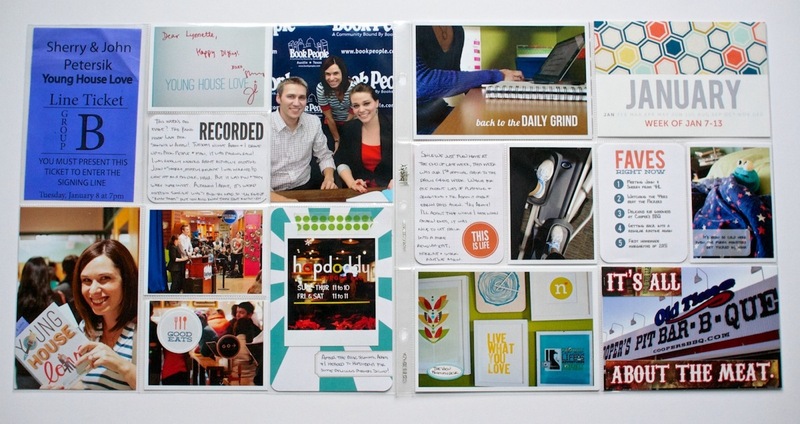 Here’s what all the cards looked like once I added them to the page protector. 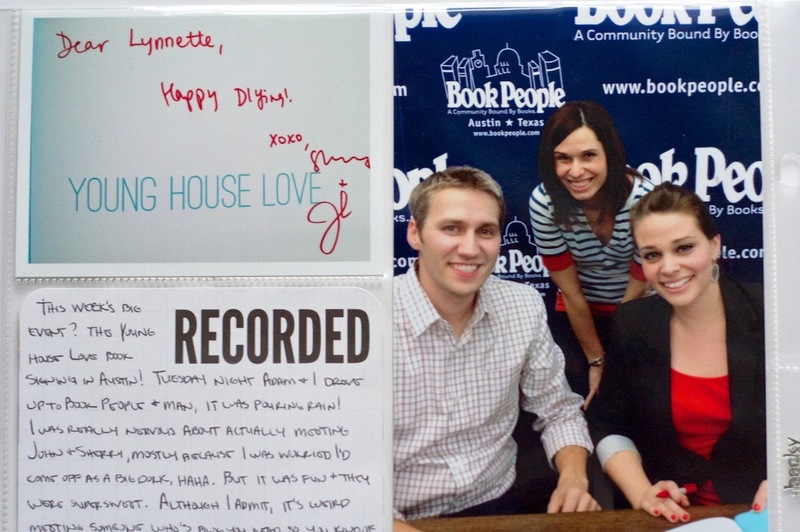 I’m not going to lie, I’m totally in love with the talk bubbles – they’re so fun! 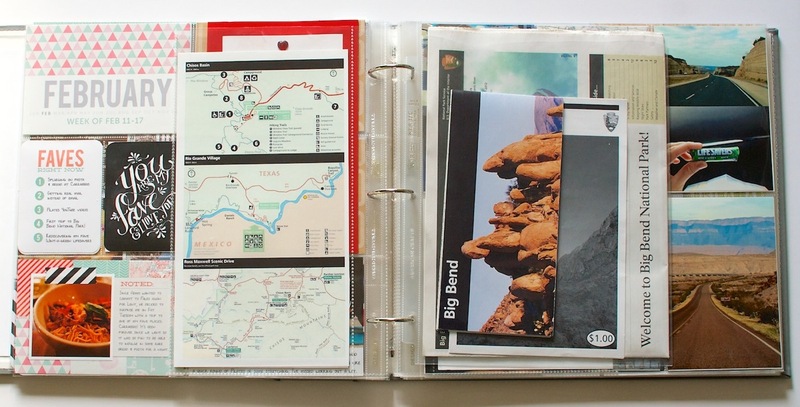 I can definitely see using them again as part of my regular Project Life pages. And here’s what the back of the page looks like right now. Since I’ve only done up through Day 12, the majority of this page is blank. 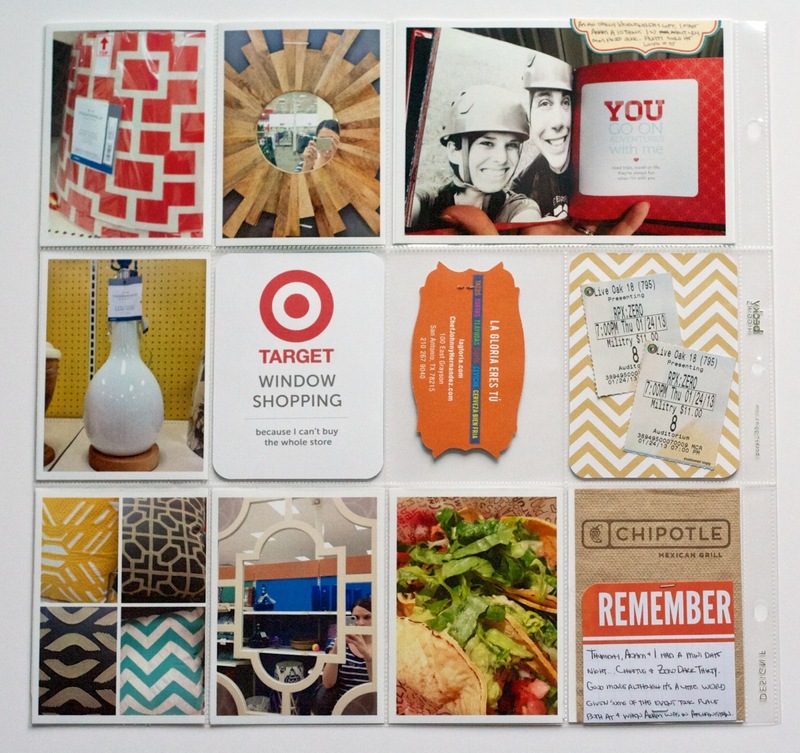 I purposely went with a textured off-white digital paper for the background of the cards because I wanted them to stand out from the regular bright white 3×4 cards I use for Project Life. 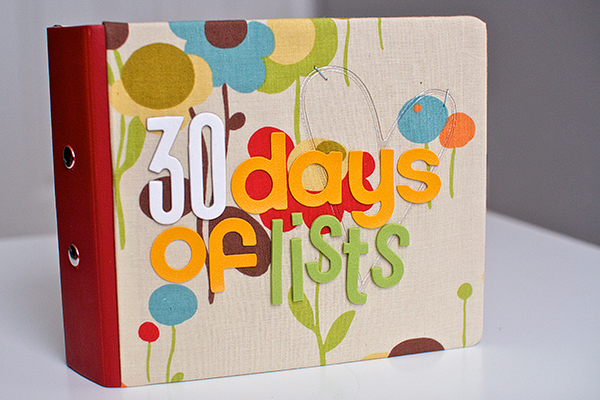 For all of the list titles I used the font Avenir and for the lists themselves I used my own journaling font Darcy Baldwin made for me. I love the way the handwriting font makes it feel so much more personal without me having to actually write everything by hand. If you don’t already have a custom handwriting font by Darcy, RUN, don’t walk or wait for a sale, and get yourself one because they are awesome. 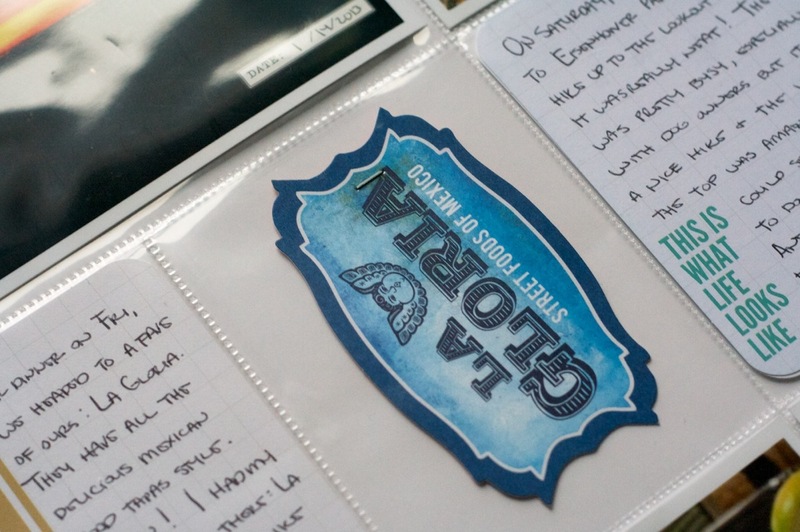 Here’s a close up of the texture of the cards. I really wanted the colored talk bubbles (which I made using the shape tool in Photoshop) to look like they were actually printed on the textured background paper, so I added a duplicate copy of the paper above the talk bubble layer and changed the blend mode to Color Burn. Because the paper was fairly neutral, it added a nice texture without altering the color too much. 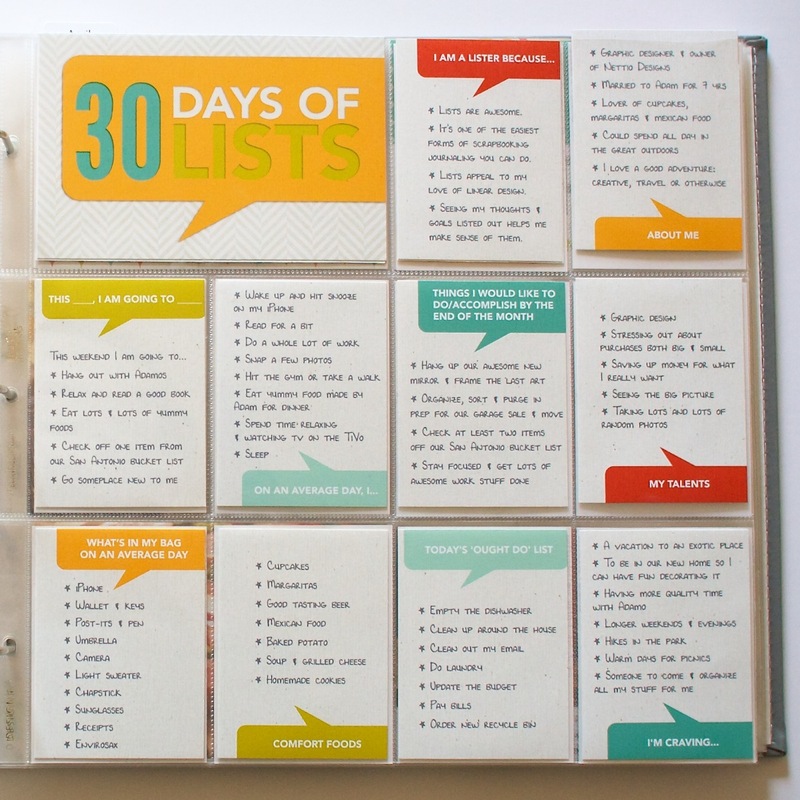 If you’re wondering how I’m planning to incorporate my 30 Days of Lists pages into my Project Life album, the answer is I have a plan, but you’ll have to wait until my next Project Life update to see it in action. 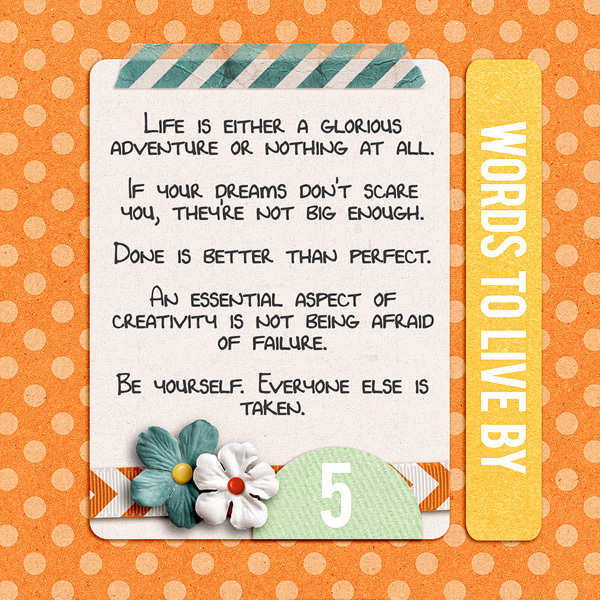 And that’s pretty much it for this list-tastic Creative Adventure! I will be back to share an update of my album once I have it all completed but I have to say so far, I’m so very glad that I took the simple route this time around. This project is definitely a case where less is more. 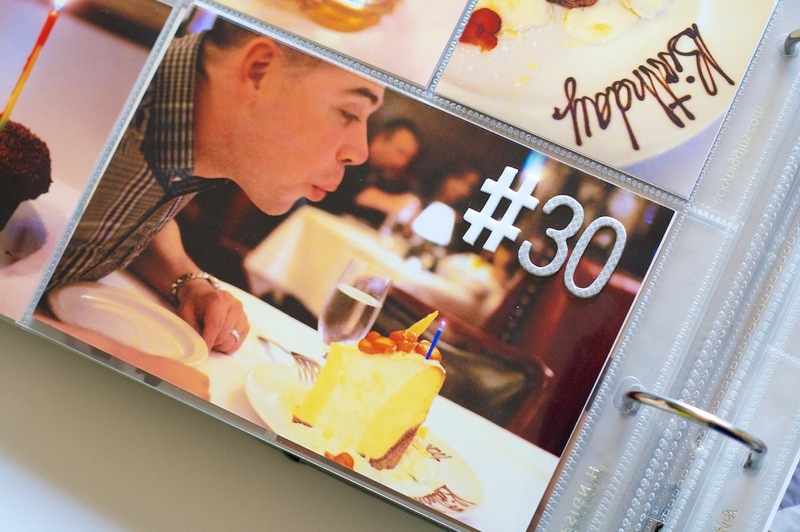 In honor of my 30th birthday, I’m challenging myself to go on 30 creative adventures before the end of 2013. This is Creative Adventure 6 of 30. You can read all the details behind this project here and find links to all my completed adventures here. 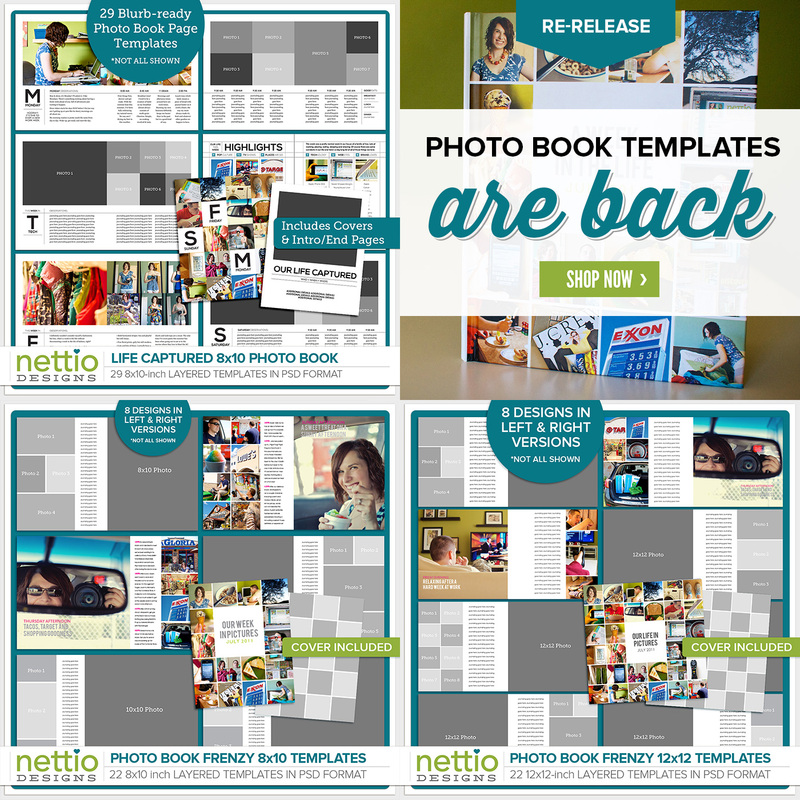 Welcome to Project Life, Weeks 7 & 8. 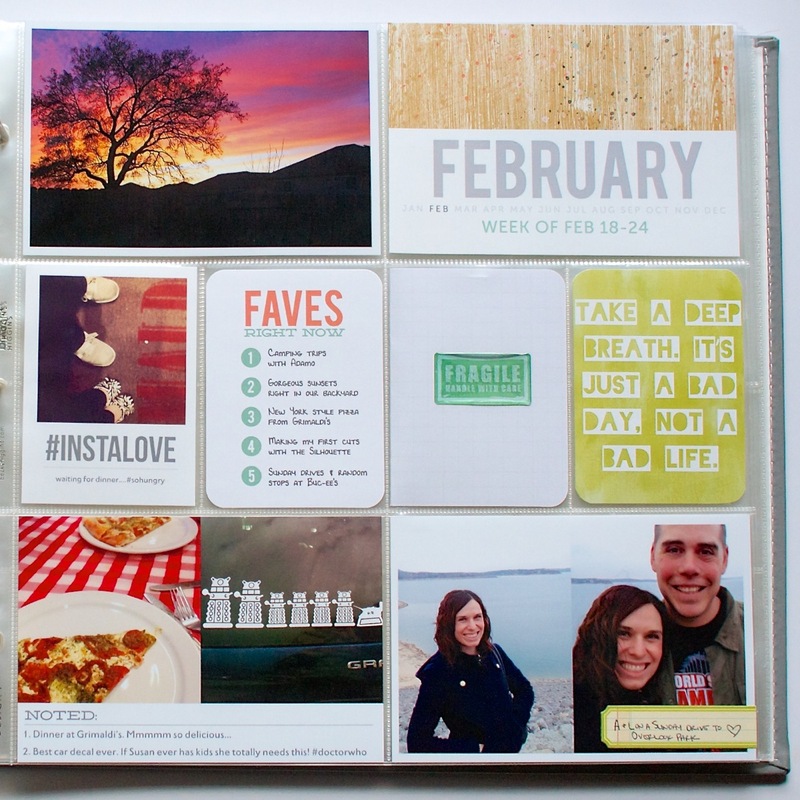 I realized this past week that I need to give myself a bit more time to put together these Project Life sharing posts. As much as I love sharing my pages, these posts take practically as long to put together as designing the pages themselves! 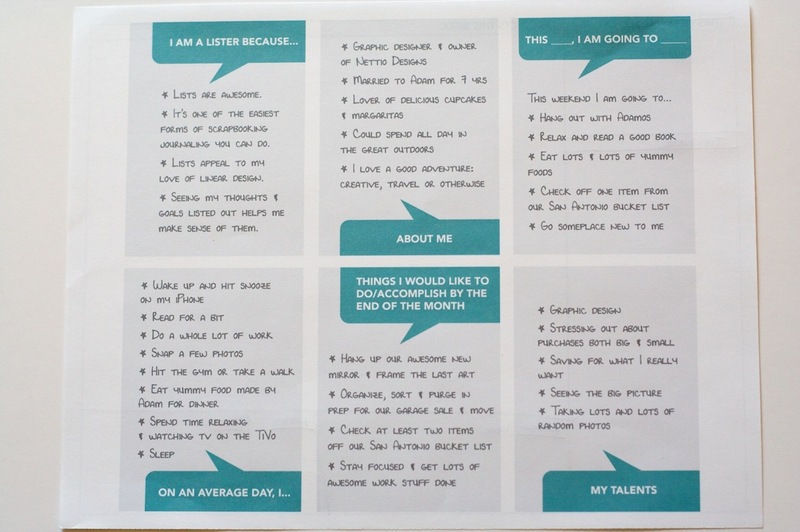 So starting now my goal is to share my Project Life pages every other Monday but with a week in between – so Weeks 7-8 are being shared now at the start of Week 10 and Weeks 9-10 will be shared at the start of Week 12. Up to this point I’d been trying to put together my two weeks of pages, take & edit photos and write the post all in one day and well, it was so.not.working. So I’m hoping this’ll give me time to play and send my photos out for printing since I know printing at home has been a major sticking point for me. But I do reserve the right to change my mind at any point if this totally doesn’t work either, haha. With that out of the way, let’s get to Weeks 7 & 8, shall we? 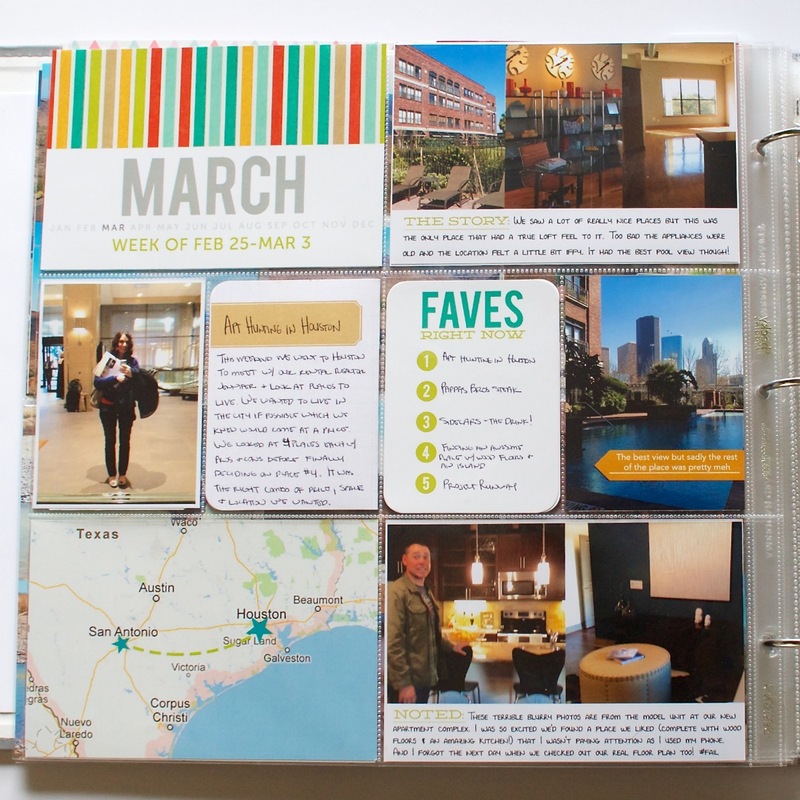 These two weeks were so much fun to put together because it was my first time adding additional inserts to my weekly spreads. 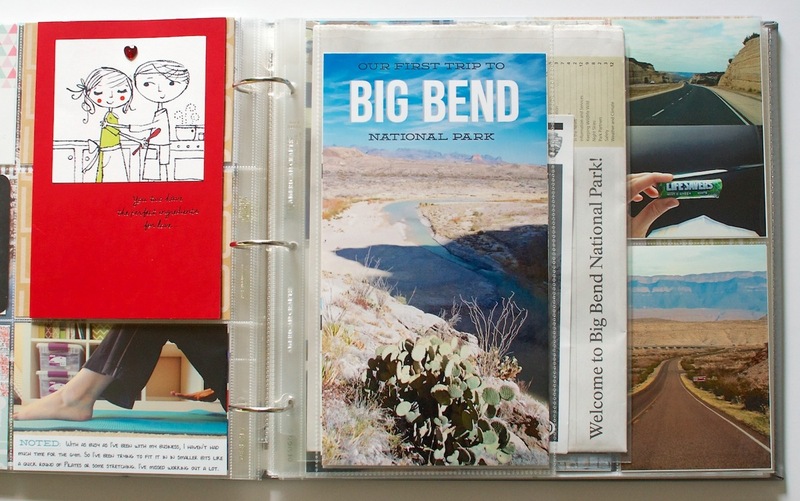 I knew I wanted to capture our weekend adventure to Big Bend National Park and since the trip loosely spanned across two weeks (we drove home on Monday of Week 8), I decided the easiest plan was to create a single page each for my everyday type stuff and then use the extra pages and some additional insert for the trip. I LOVE how it turned out. Here’s a look at the Week 7 spread. On the left is everyday stuff from Week 7 and on the right is the start of the trip pages. 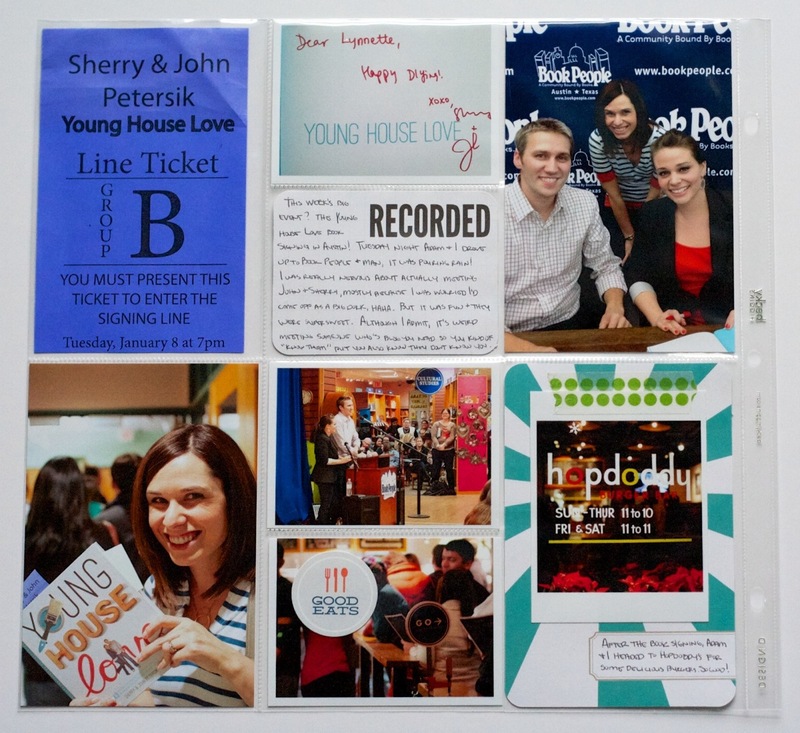 Here’s a closer look at the 4×6 Journalers – Paper Love card. 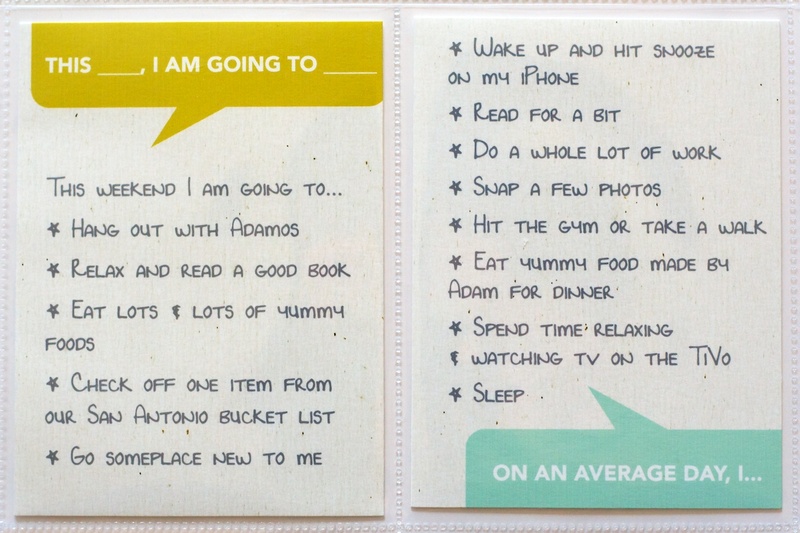 These templates made these cards SO easy to put together and I love the little pop of pattern and color they add to the page. 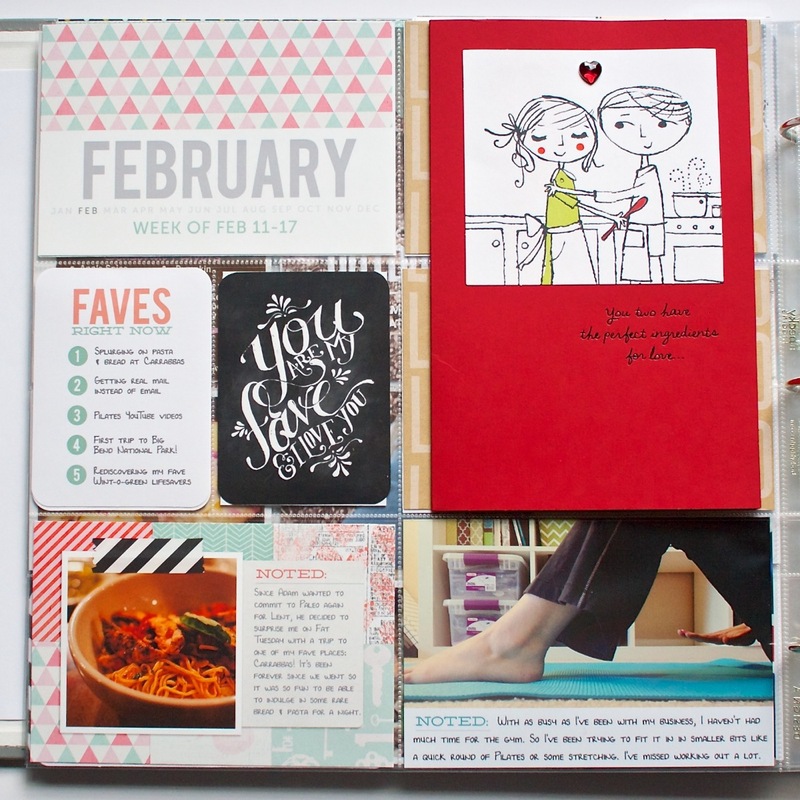 I chose papers from the same kit I’m using for my February title cards (You Hold the Key to My Heart by Zoe Pearn & Jenn Barrette) to keep things cohesive. 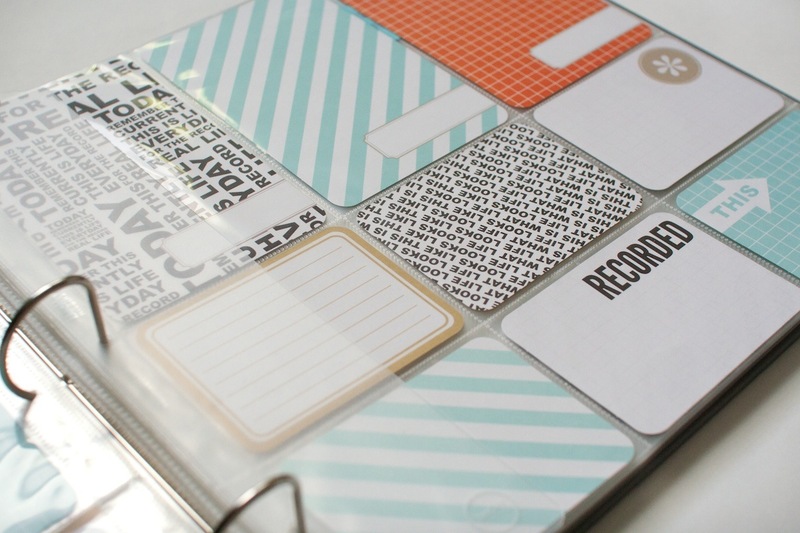 In the right corner you can see one of the 4×6 Journalers – Graphic Love. 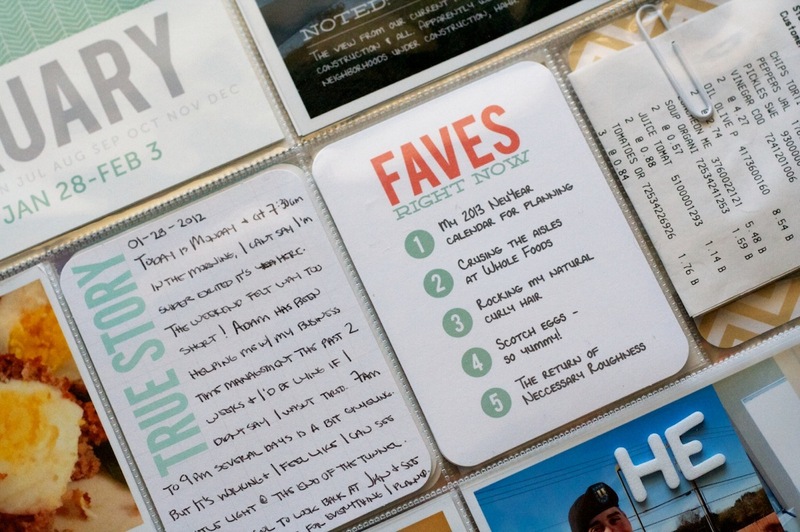 I love the balance of the clean & graphic vs the scrappy and paper-lovin’. 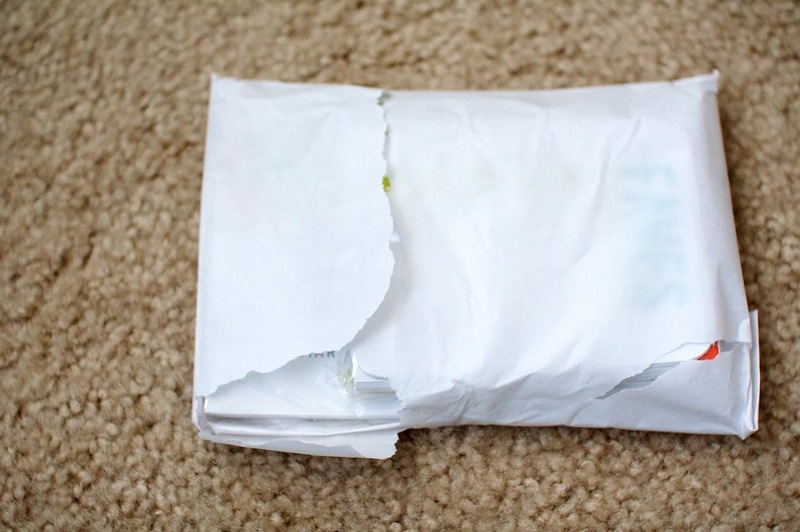 My mom mailed me a Valentine’s Day card and since I wanted to be able to open it and not chop it up to fit in the pockets, I ended up using some tape runner (Scotch Adhesive Dot Roller) to attach it to the front of the page protector. Here’s a look at the start of the right side of the Week 7 spread. Since the trip was kind of a big deal, I decided to make it it’s own title page to signify that this was the start of the trip. 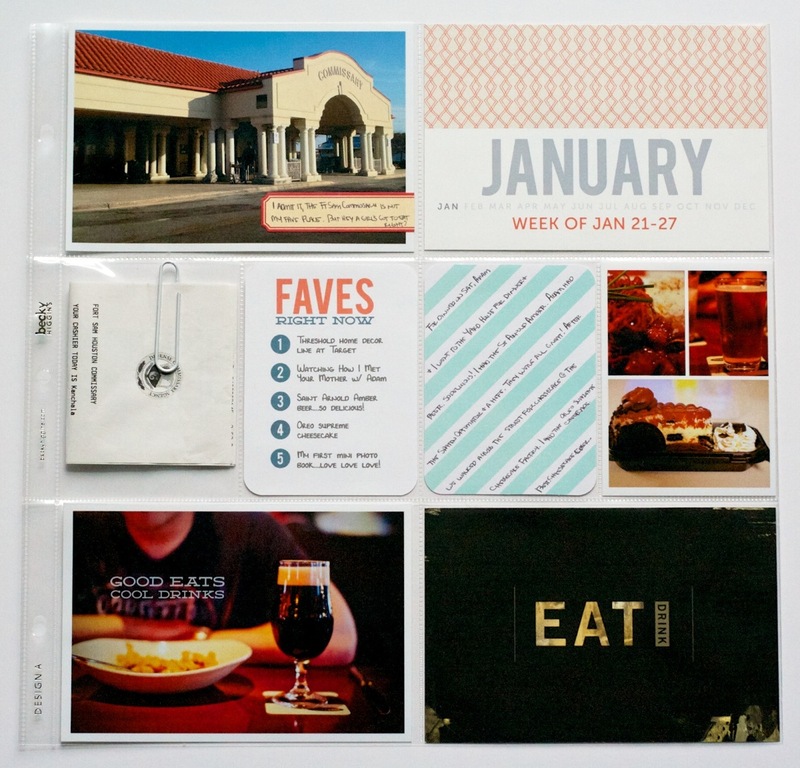 It’s 6×11 and I just added it to the album using an American Crafts 6×12 page protector. Playing with type and especially adding text directly to photos may just be my favorite part of Project Life. 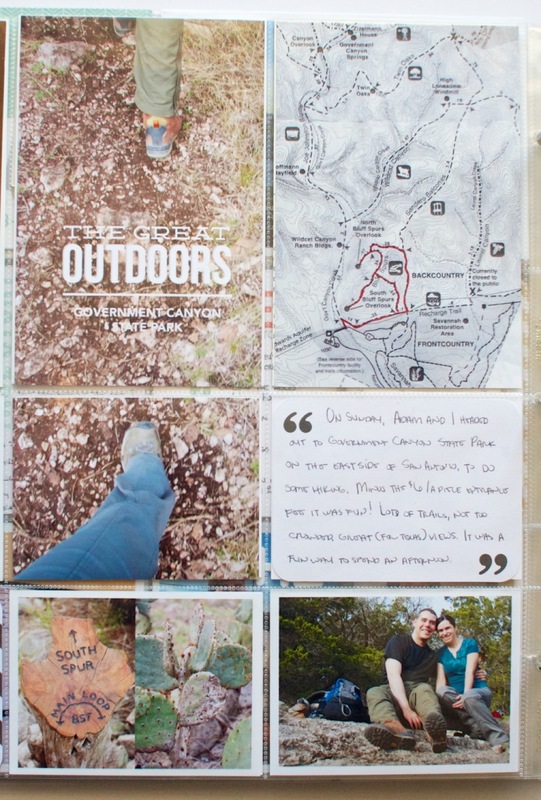 When you turn the title page, you’ll find a map of the park as well as an 8.5×11 page protector (from We R Memory Keepers) that holds some of the papers we were given at the park. 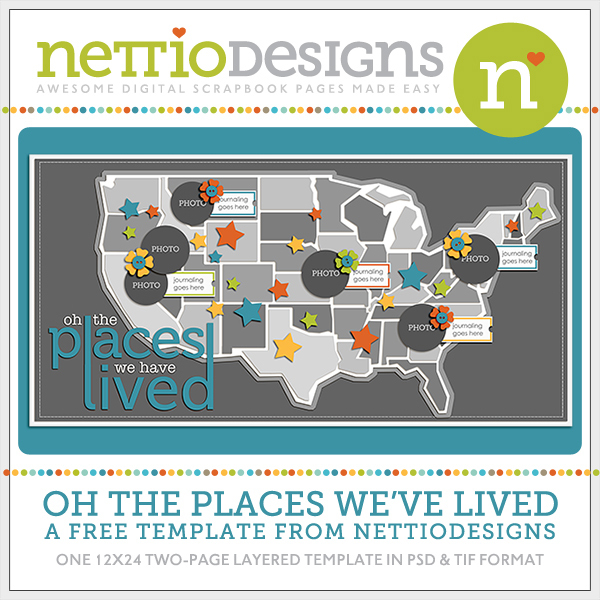 On the back of the 6×11 title card, I added a printed version of the map of the park. 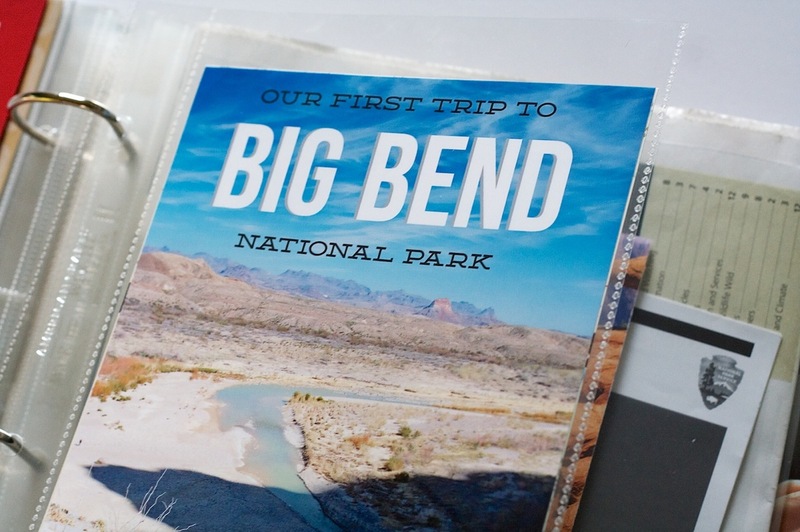 The National Park Service has downloadable PDFs available on their website so I just downloaded that, placed it into Photoshop, cropped and printed. 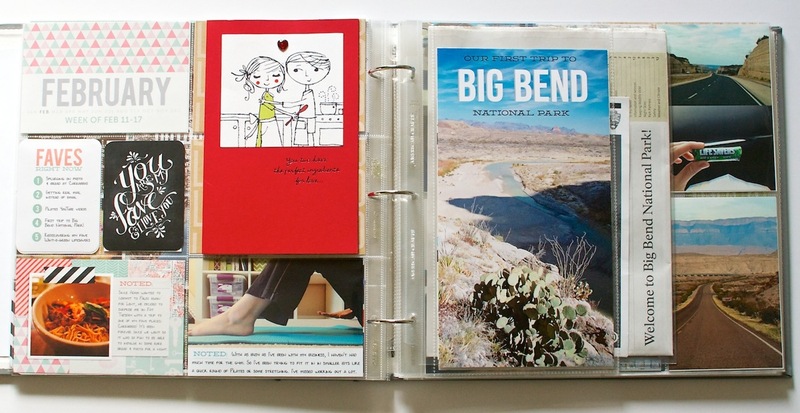 For my trip journaling, I added two additional 6×12 page protectors to hold four 6×11 journaling cards. 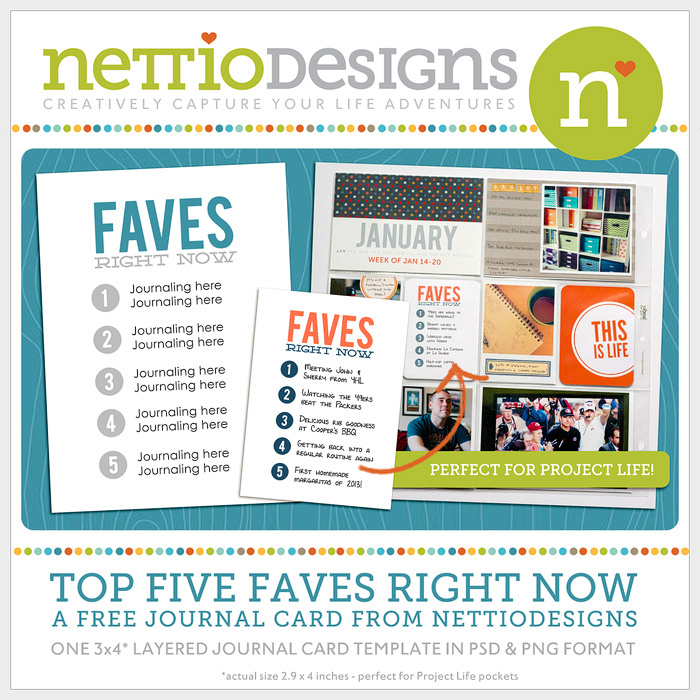 To make my journaling cards, I copied the text directly from this blog post and then formatted it using Adobe InDesign. SUPER easy and saved me the trouble of having to rewrite what we did on the trip. 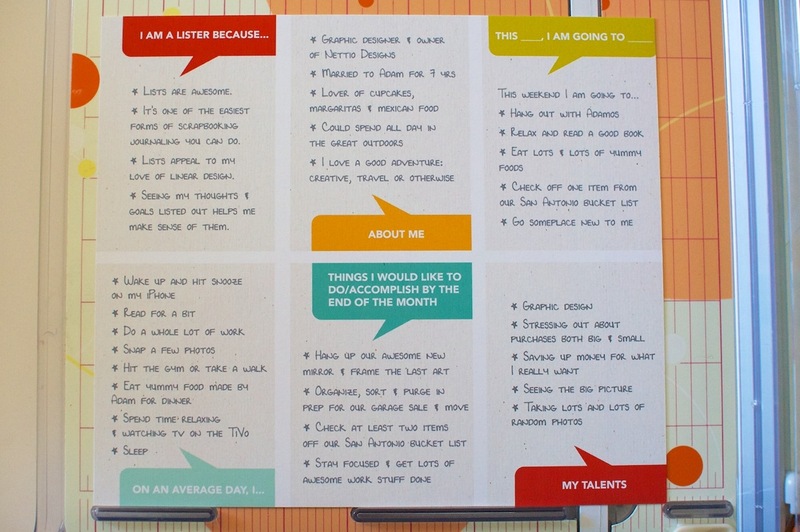 Since the Epson Premium Presentation Paper Matte I have is double-sided, I decided to try printing my journaling double-sided on a single sheet of 8.5×11 paper. 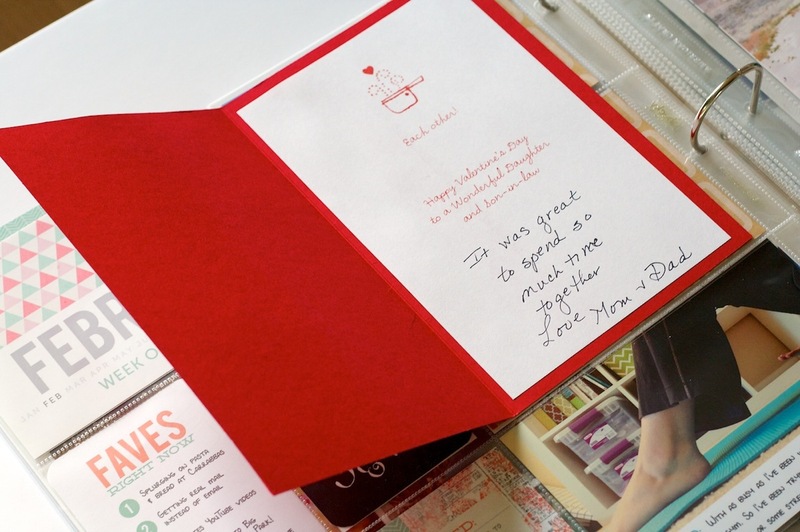 A tip for doing this if you’re printing 6×11, make sure you align the text on the backside of the card opposite from the front side – front aligned to the left of the page, back aligned to the right. 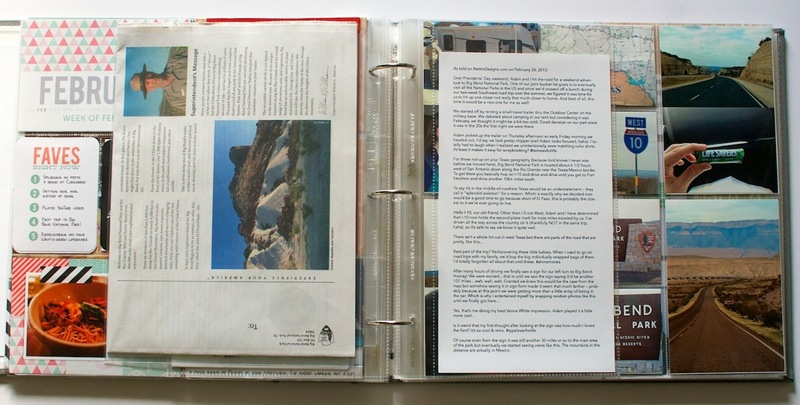 Otherwise when you go to trim the 8.5×11 sheet of paper down to 6×11, the journaling will be cut off. 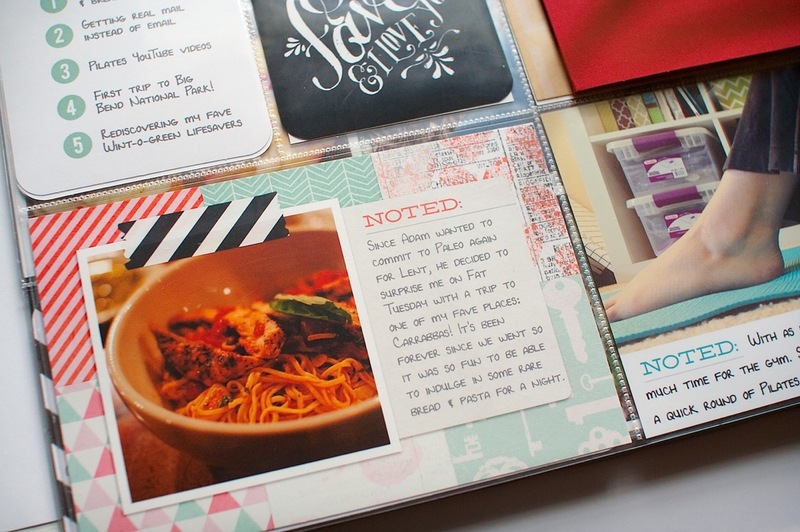 Here’s a closer look at my printed journaling. 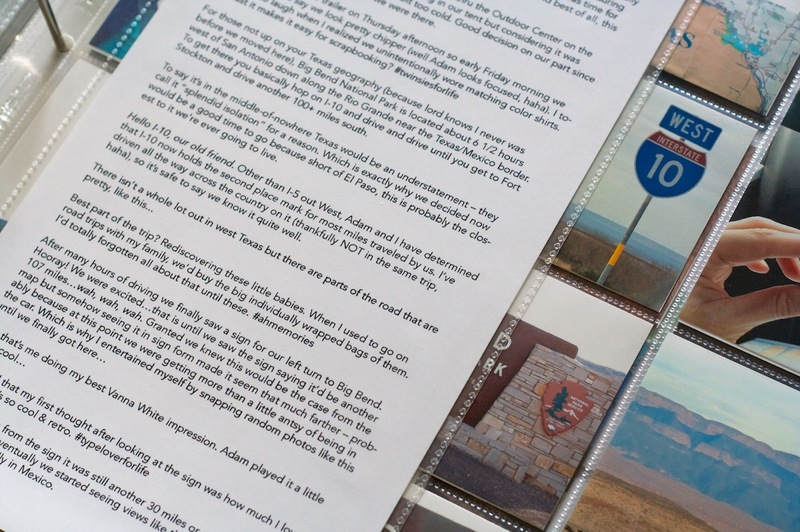 I can definitely see using this format again as a way to get longer stories into my album. I love the way the photos peek out from behind the text like a little preview of what’s to come. The right side of the Week 7 spread. 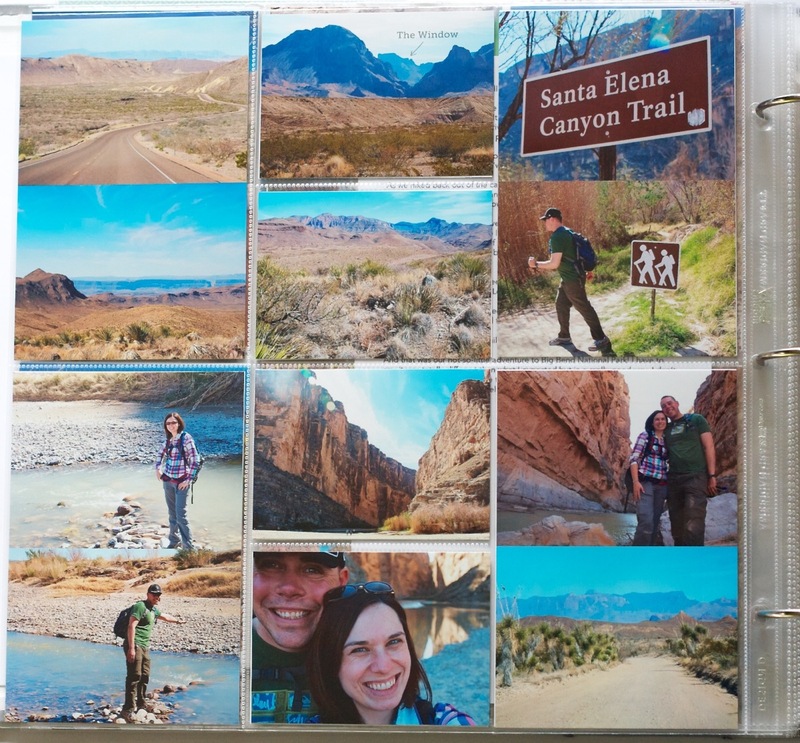 I used two Project Life Design D page protectors for my trip photos since I loved the mix of vertical 4×6 and smaller horizontal pockets. They worked really well for my photos. 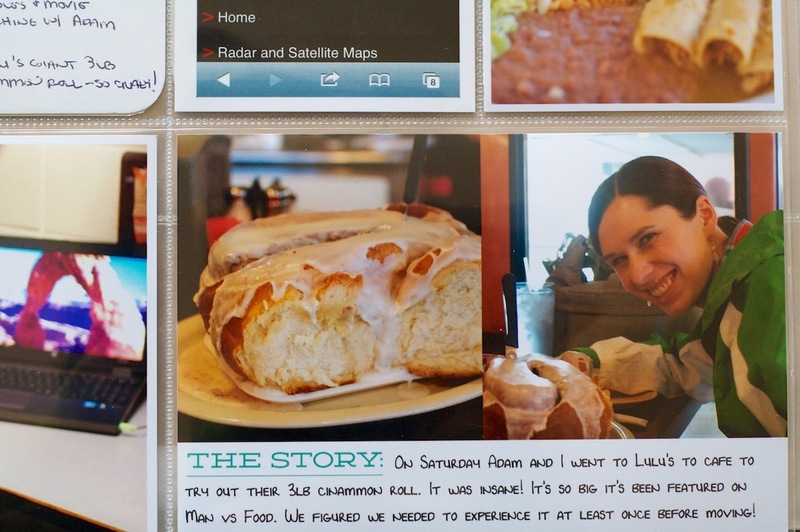 A closer look at the photo page. 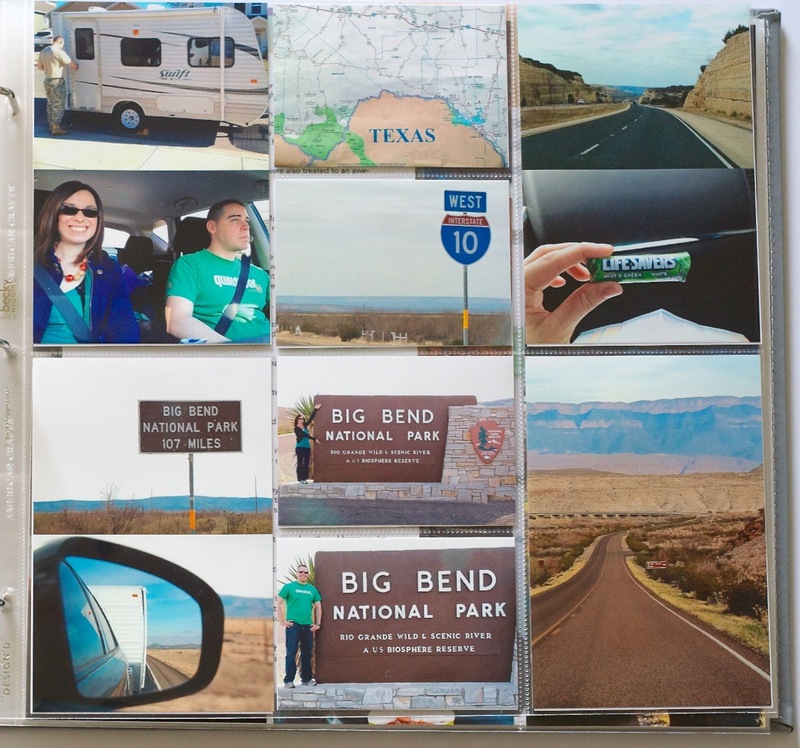 Since I had more photos than I had pockets for, I ended up printing two 3×4 photos on a single 4×6. I love it plus it reduced the amount of trimming needed! 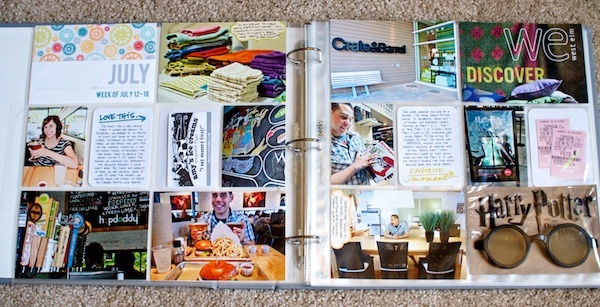 Here’s the second half of my journaling and photos. 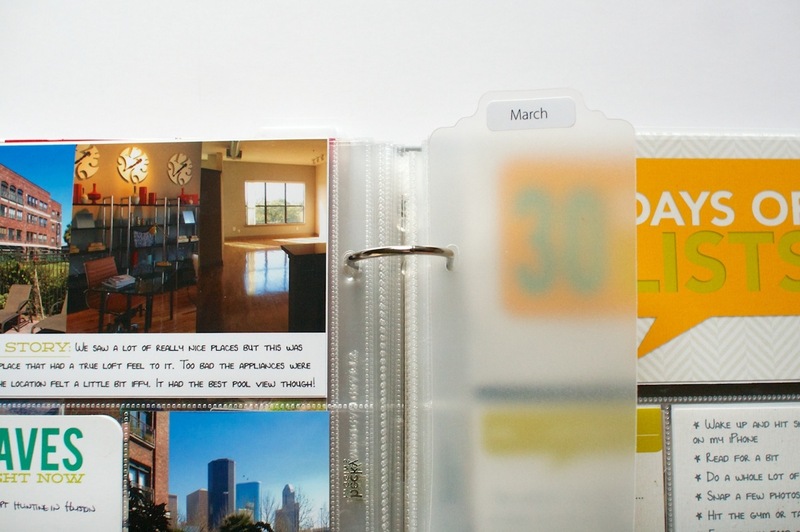 I decided to space the journal pages out since the spacing worked out that the journaling on the first card fit with photos on the first two pages and the journaling on the second card fit with the second set of photo pages. 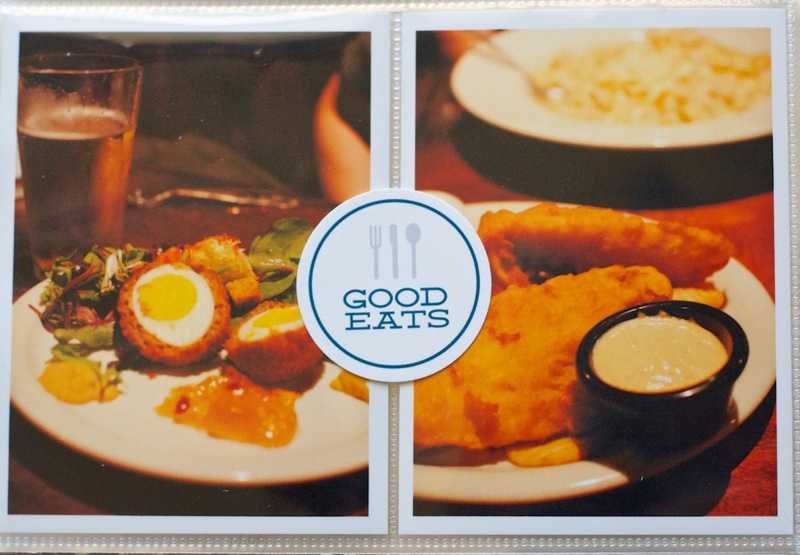 Close up of the left side photo page. These pages are the first ones I’ve done where I’ve laid everything out in Photoshop first and then printed. It was definitely faster than my previous post-it note method! Close up of the photo spread. 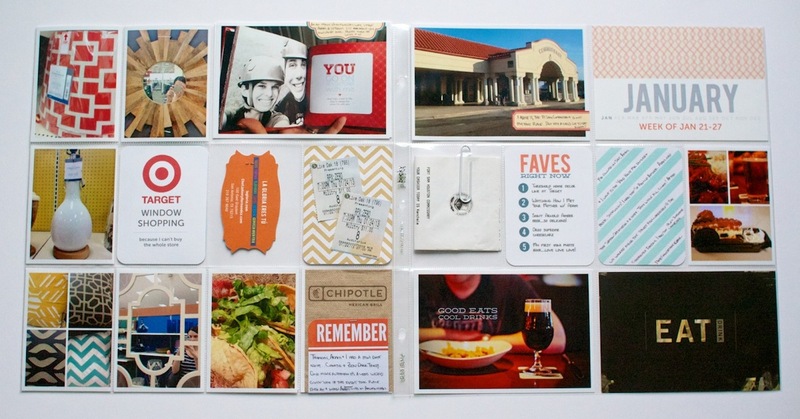 I tried to feature a good mix of photos in my larger vertical 4×6 pockets. And here’s the Week 8 spread. On the left is the final set of photos from the trip and on the right is everyday stuff from Week 8. It was a little tricky narrowing down 6 days into one page but I’m happy with how it turned out. 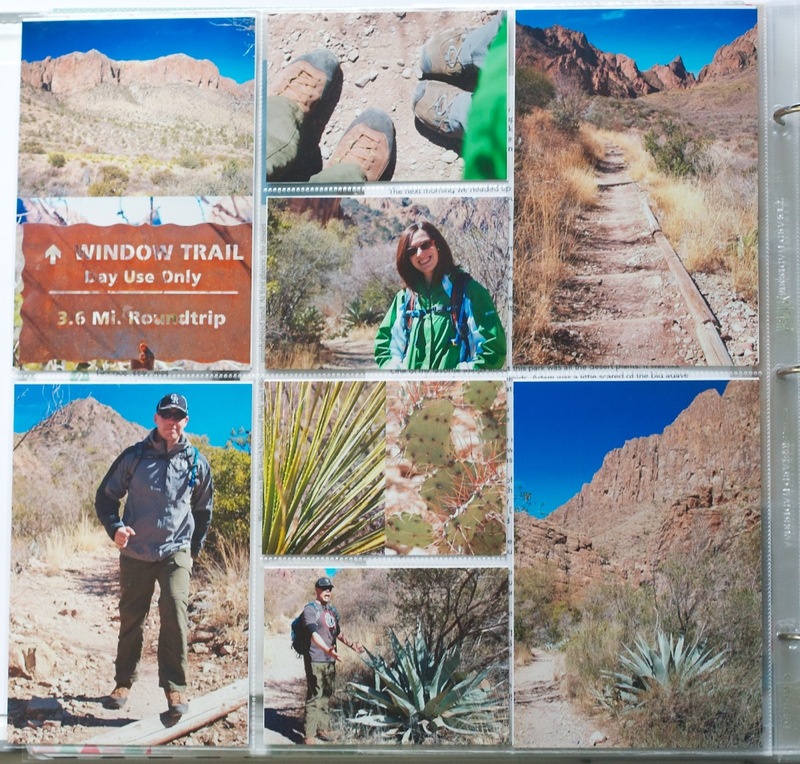 Close up of the final photo page from our trip. 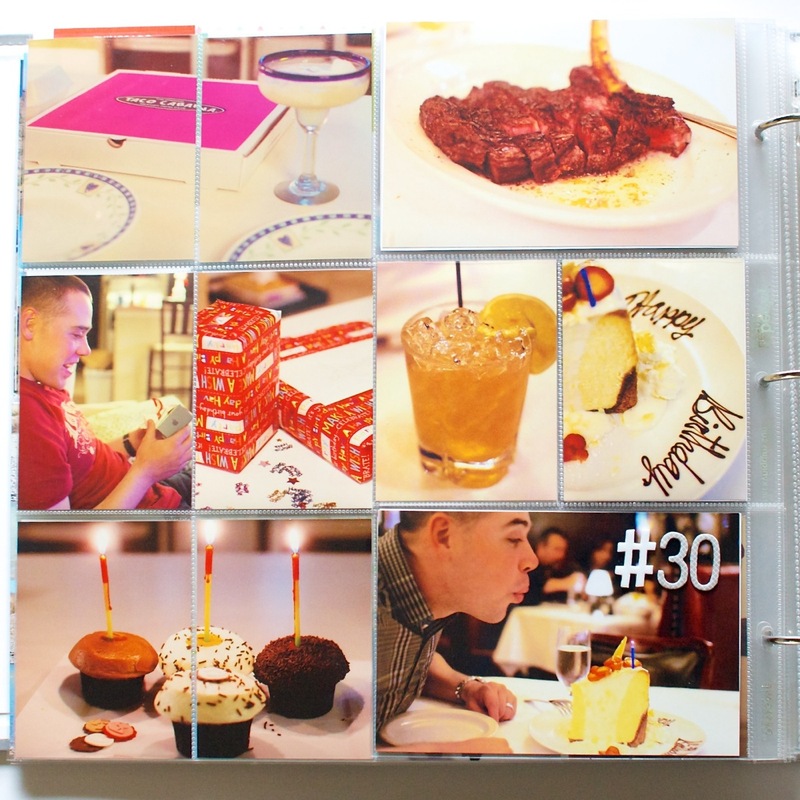 This page didn’t actually end up having any true 4×6 photos – they all were two 3×4 photos on a 4×6 sheet. 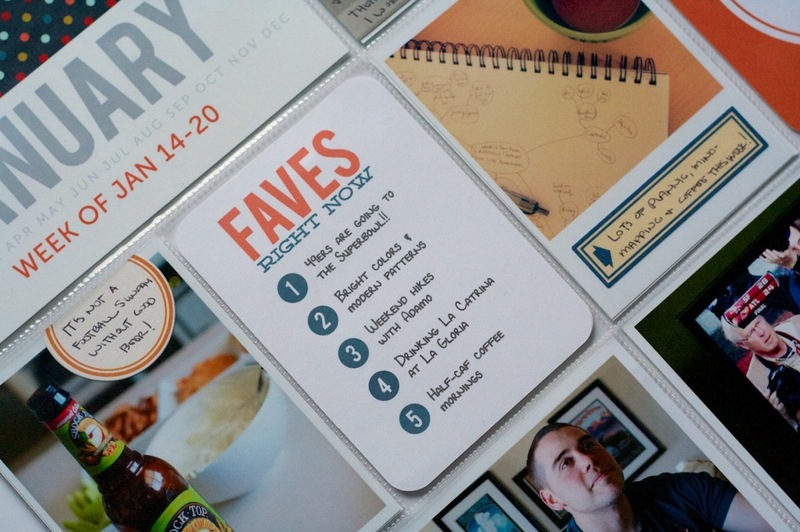 I really wish there was a Project Life page protector design that had horizontal 3×4 photos like this! 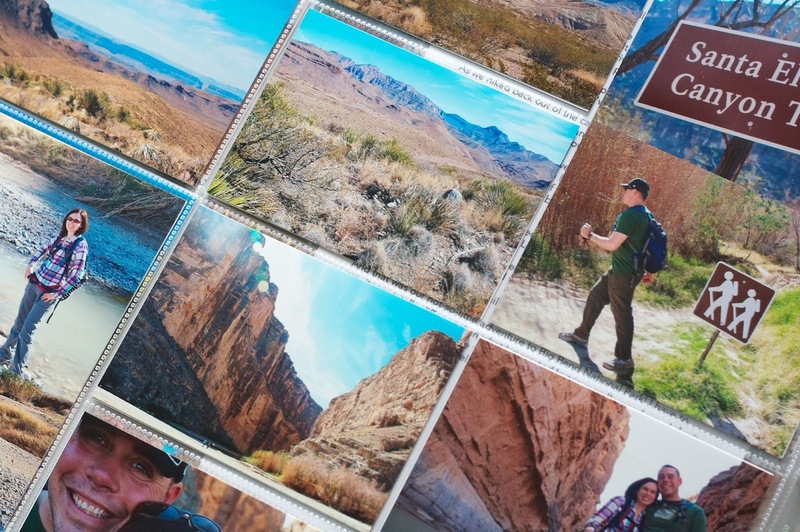 The trip photos are the first set of prints I’ve sent out for printing since starting Project Life and I have to say, as much as I like the flexibility of printing at home, I love the ease of uploading and slipping in printed photos even more. Sure beat babysitting my printer for 24 photos! 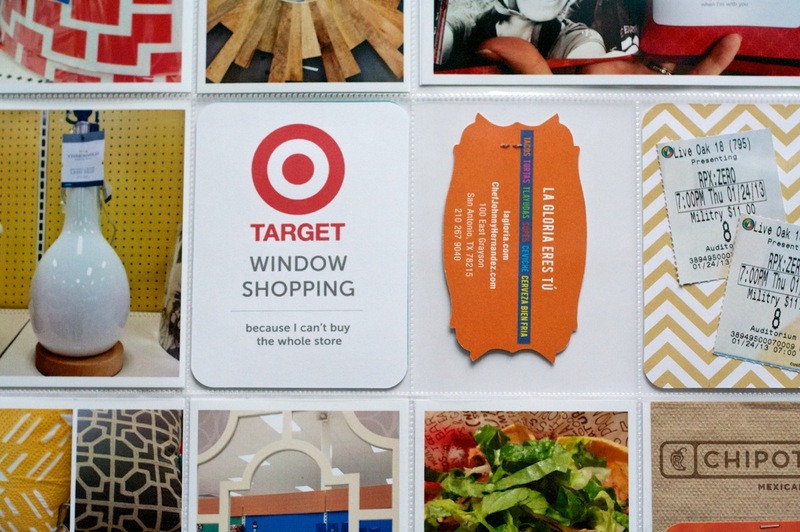 I sent them to our local Target and while the blues came back a little too saturated overall I was happy with the quality of the photos. Here’s a closer look at the right side of the Week 8 spread. 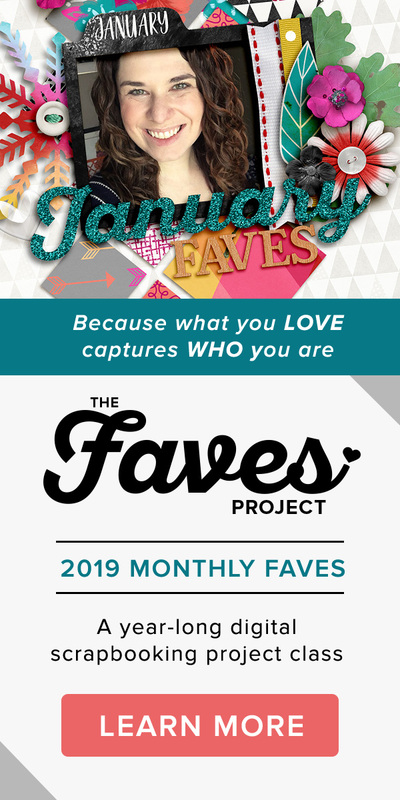 Everything this week was fairly normal: Monthly Title Card, Faves card (available for free here), another 4×6 graphic journaler and a couple of photos. The sunset photo was taken one night from our backyard – other than deepening the blacks a little, it’s pretty much straight out of the camera. The sky was really those colors! 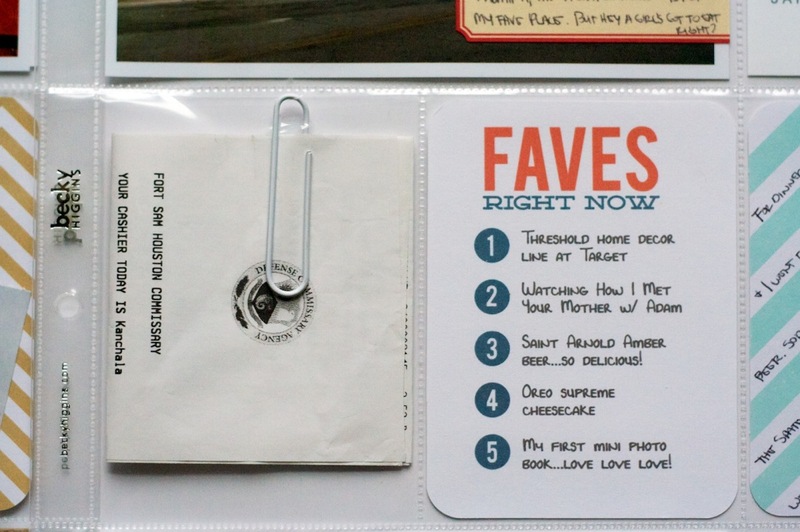 The Fragile Handle with Care card is actually a folded 4×6 journal card from the Project Life Seafoam core kit which includes some personal journaling I wanted to capture but didn’t want out for just anyone browsing my album to read. This seemed like a good compromise. That’s also the only card from the Seafoam kit I used this week. 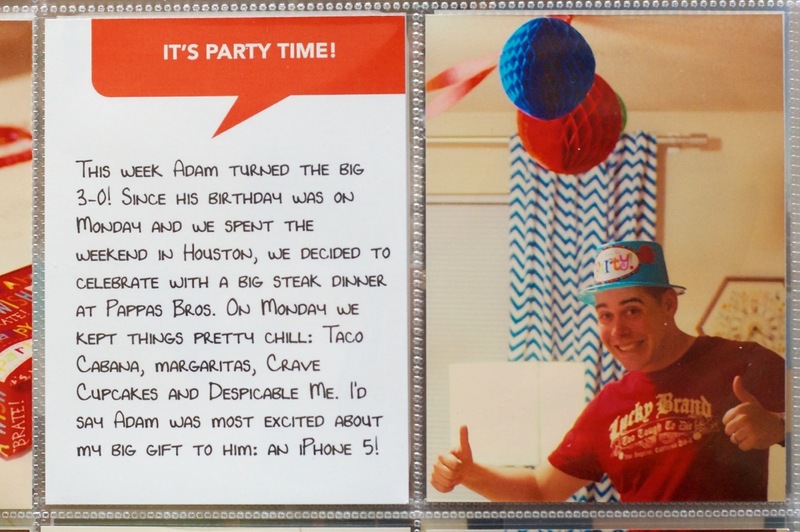 Everything else was either photos, my templates or printable accent cards. 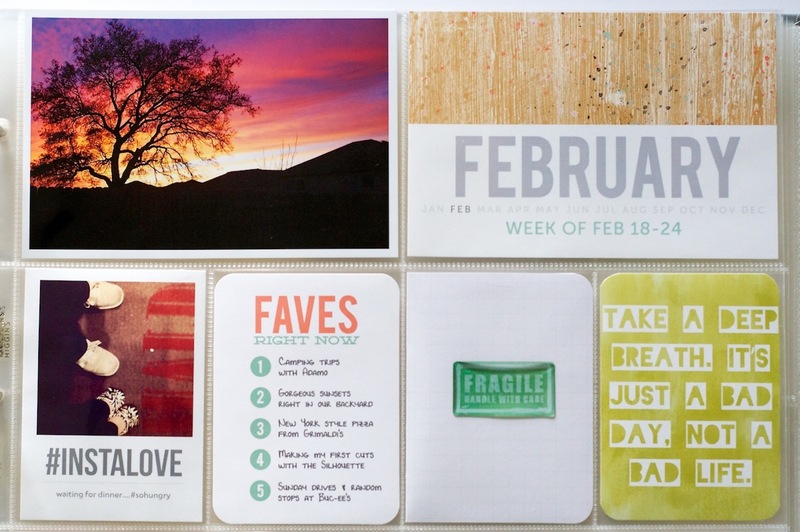 The take a deep breath card is from Jenn Barrette’s Resolutions: Patience, Relax, Breathe 3×4 cards set. 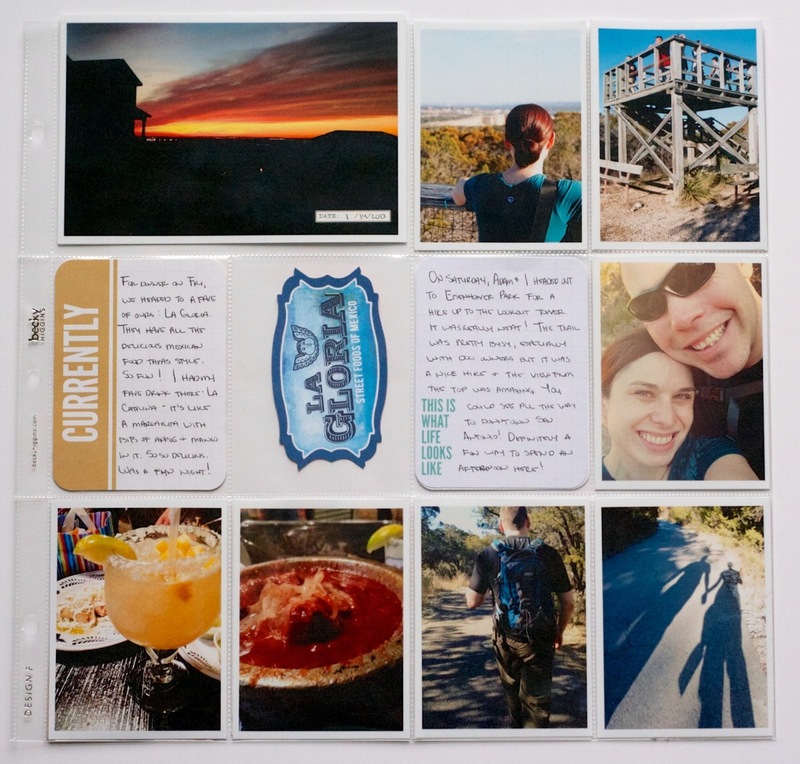 The InstaLove hashtag card is something I whipped up real quick (and am totally in love with) and the Noted photo card is from my 4×6 Journalers – Graphic Love templates. 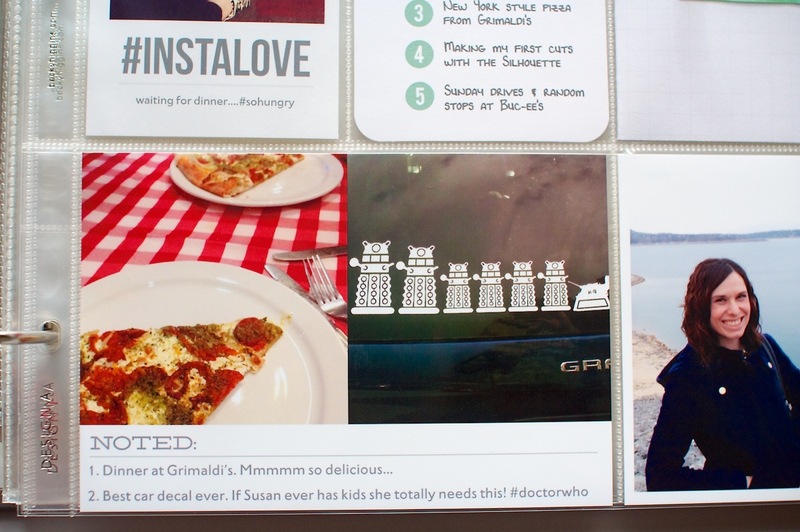 The Doctor Who themed car decal photo is actually a photo Adam sent me from the parking lot at his work. It was too awesome not to include! After 8 weeks of doing this (minus Week 1 which I still have to go back and add), I am starting to see the bigger picture of the album come together and I am so in LOVE with it. 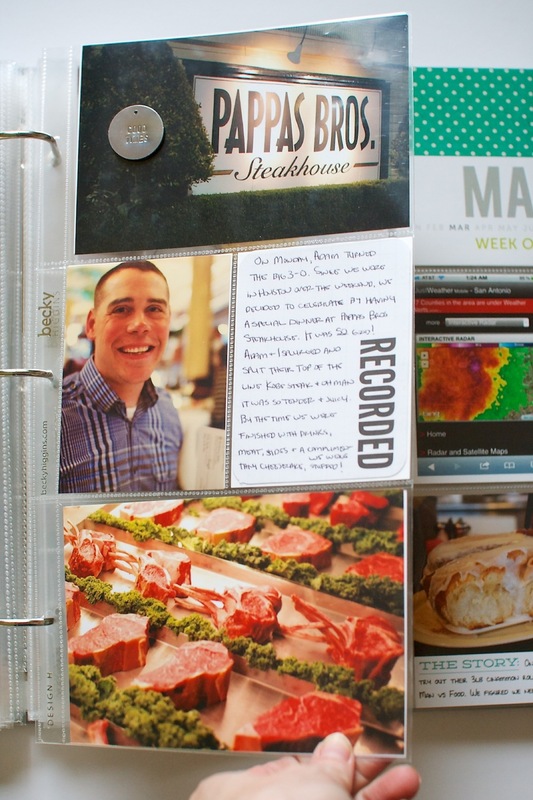 It’s a ton of work but so worth it when I watch Adam flip through the weeks and smile at all these small stories captured. I asked him if he thought this format was more approachable than my digital pages and he said he thought so. I think it’s because it’s more clean & streamlined and less product focused. 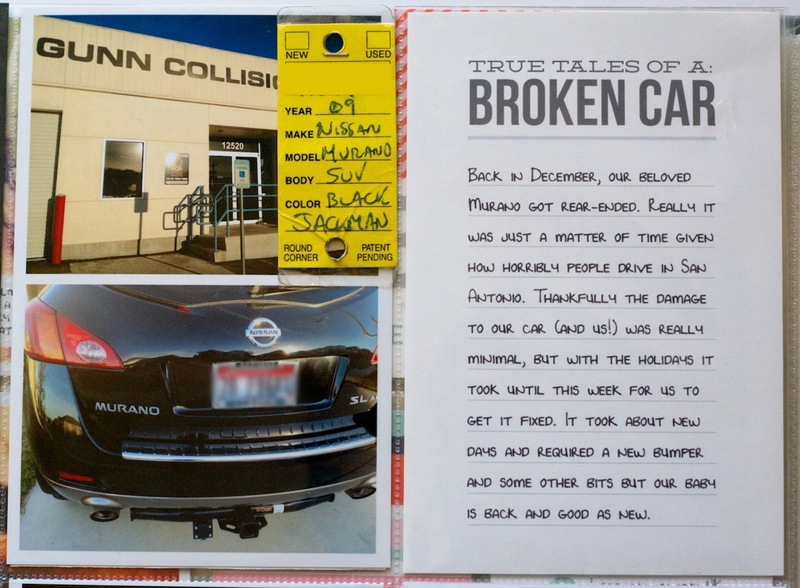 I still love digital pages for more personal journal-type pages but I love this format for these types of stories even more. I’m definitely considering sending all my regular sized photos out for printing moving forward. 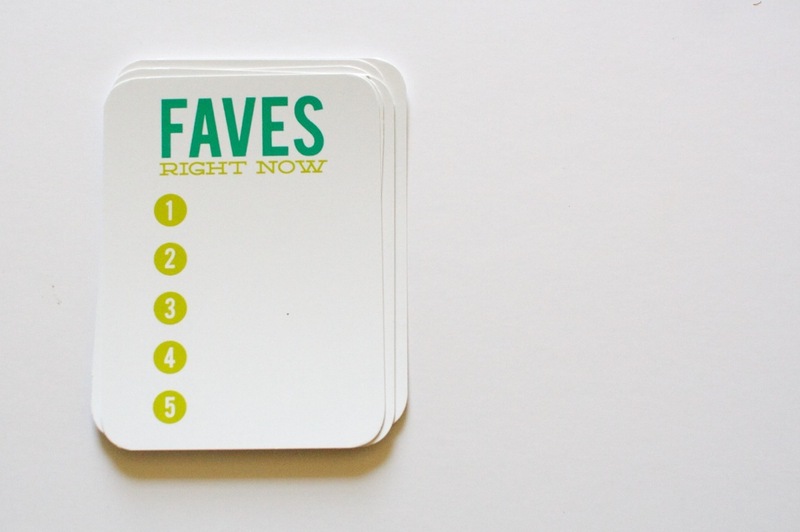 While it’s not quite as immediate, it’s pretty inexpensive and a lot less hassle for me than printing at home. Supplies used this week: Project Life Design A & Design D page protectors, American Crafts 6×12 page protectors, We R Memory Keepers 8.5×11 page protector, Seafoam core kit, Nettio Designs Bits & Bytes 2013 4×6 Weekly Title Cards, 4×6 Journalers – Paper Love, 4×6 Journalers – Graphic Love, Nettio Designs free Top Five Faves 3×4 card, Studio Calico February Project Life kit, Resolutions: Patience, Relax, Breathe 3×4 Cards by Jenn Barrette, You Hold the Key to My Heart digital scrapbooking kit by Zoe Pearn & Jenn Barrette. 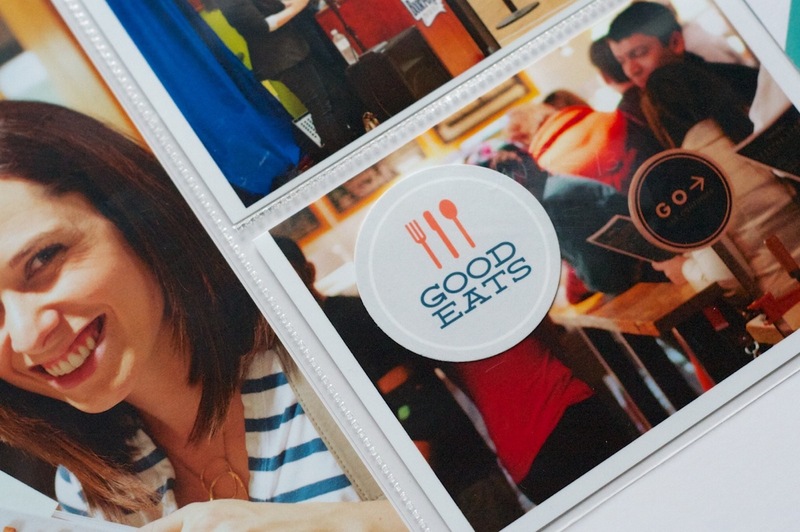 Photos/elements printed at home are printed on a mix of Epson 4×6 Premium Photo Paper Glossy & Epson 8.5×11 Premium Presentation Paper Matte and the Project Life 3×4 White Cards. 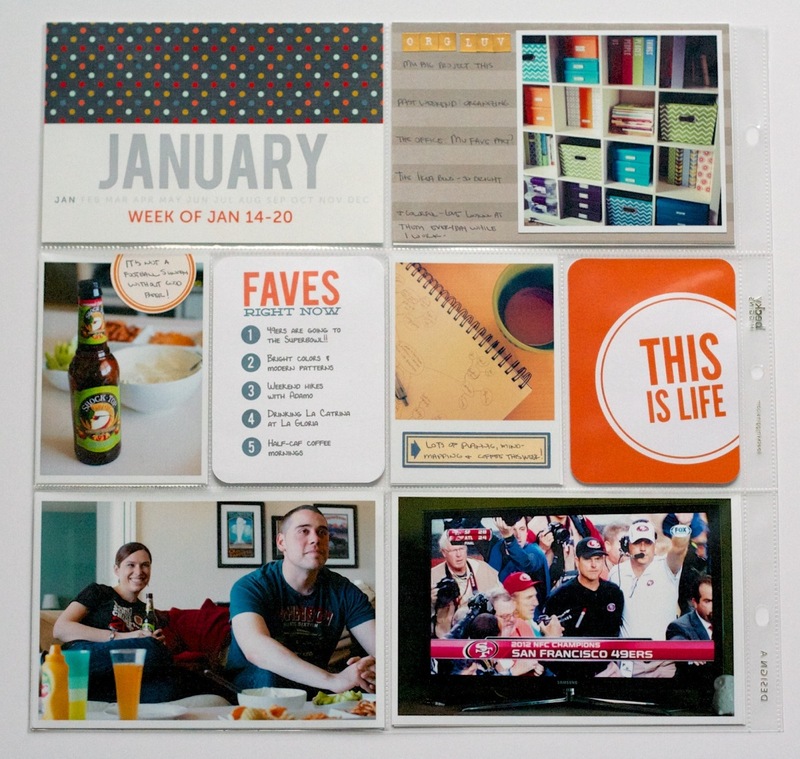 And that’s it for this Project Life 2013, Weeks 7 & 8 update! 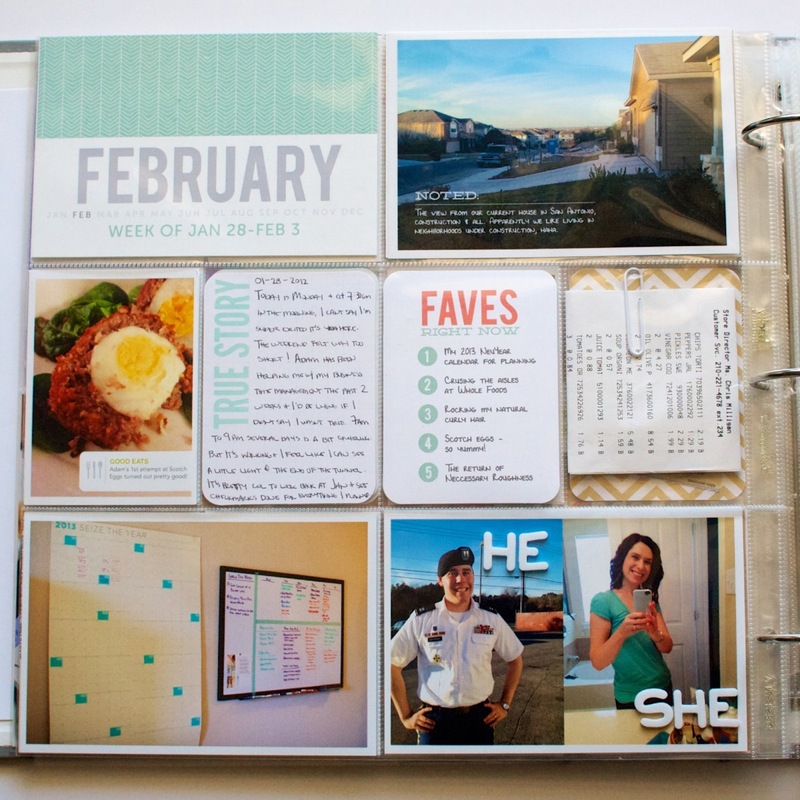 How are you doing with your Project Life album? Have you learned anything new after 8 weeks? Are you starting to see the big picture come together? 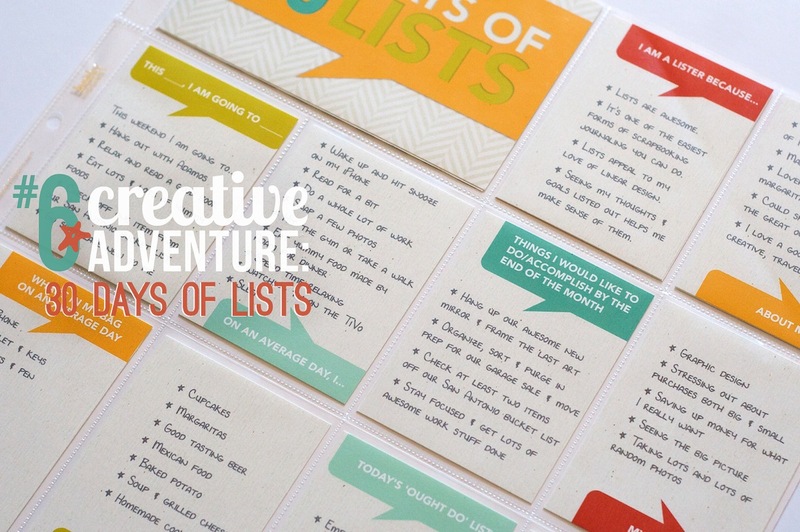 I bet you thought I’d forgotten all about my 30 Creative Adventures goal, right? I mean, it has been awhile since I last shared an update – all the way back to this one from September. But, I haven’t, not exactly anyway. Around my half-birthday in November, I made the decision that rather than rush through trying to complete all 30 Creative Adventures before my 31st birthday on May 24 (which would have meant at least 1 a week and then some), I’d rather give myself until the end of this year to finish all 30. That gives me a nice 2-a-month pace which is a lot more reasonable given all I have on my plate already. Really, my goal with this project was never about the timeline – it was about pushing myself to step outside my comfort zone and try new things creatively. Whether I do that within a year or a year and half, it doesn’t really matter to me. I’d actually been doing pretty well with this project (I have more adventures completed/in-progress than I’ve shared here so far), up until the point my grandma passed away in August and I spent a month back home in California. It killed my mojo. So I’m giving myself a break on this one. It’s how life goes sometimes and well, it’s my goal after all, so I can change the rules if I want, haha. 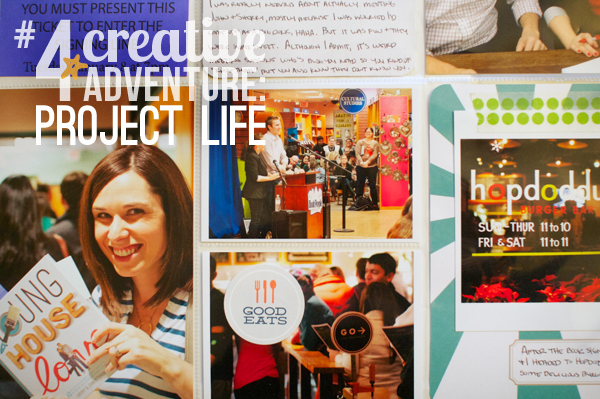 The good thing about extending my 30 Creative Adventures to the end of this year is that it allows me to take on one much larger year-long adventure this year: Project Life. 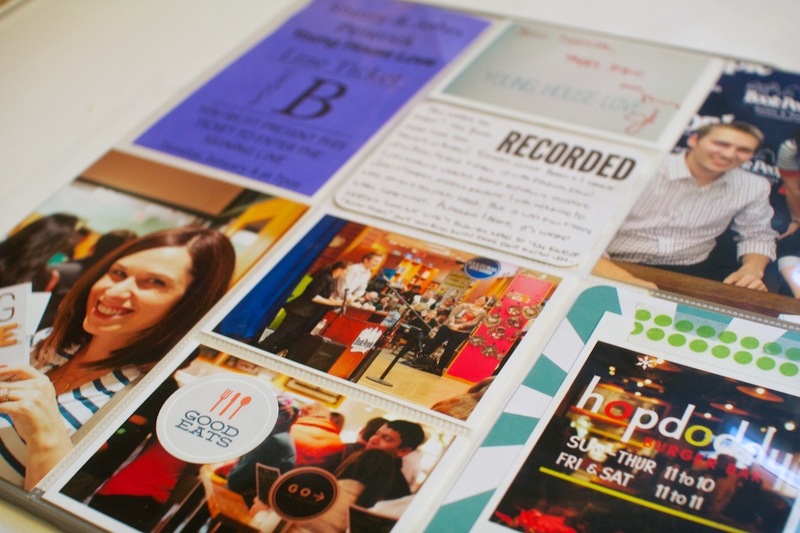 For those of you who haven’t heard of Project Life before, Project Life is a memory-keeping system created by Becky Higgins which I’d describe as a photo album on steroids. 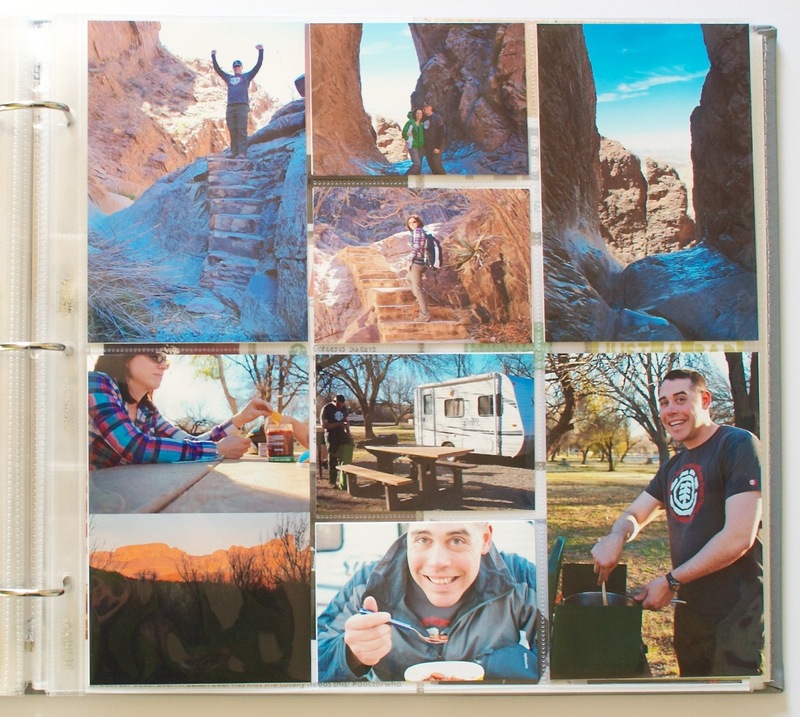 You start with pre-designed 12×12-inch pocket page protectors and then you slip printed photos and/or journaling cards in it to create your album. 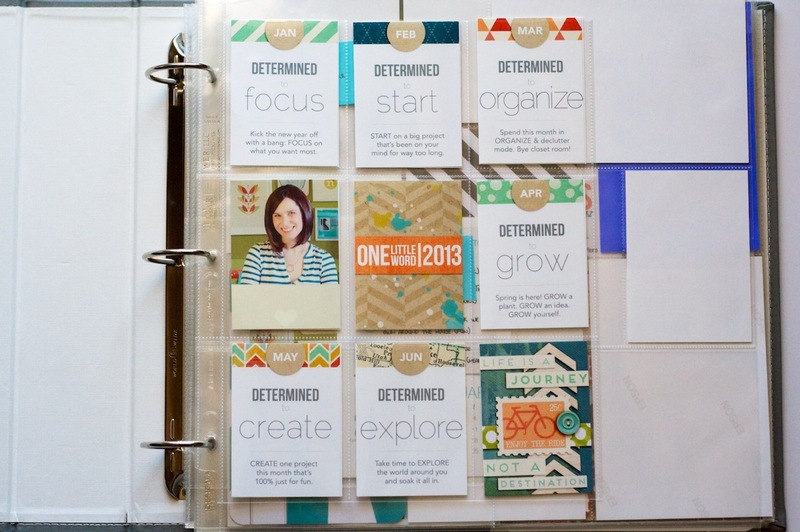 What I love about the Project Life format is that it’s super adaptable to your own life. 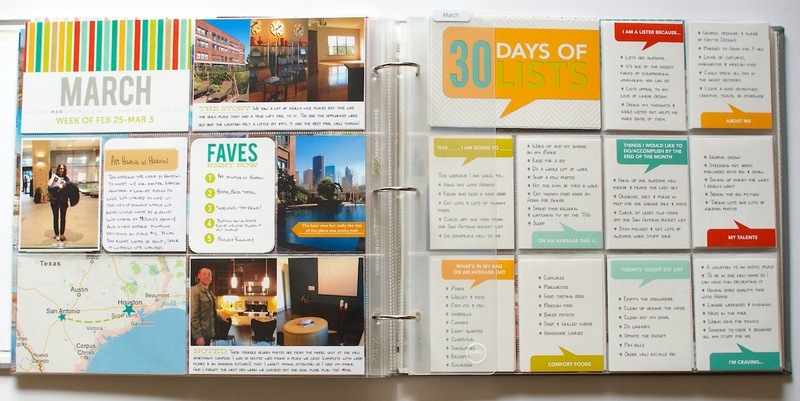 Most people do Project Life in a weekly format – one two-page spread per week – but because everything is movable, you can easily skip a week or do a single page per month if you like. 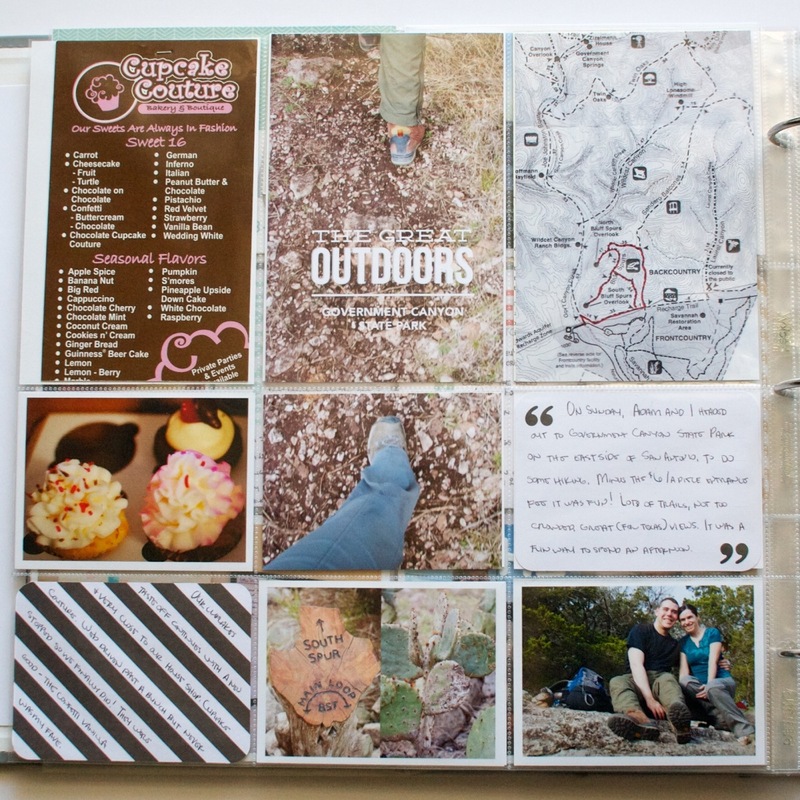 From a creative perspective, I love that you can really dress it up or down as much as you want – you don’t have to create an entire scrapbooking layout just to capture that story. 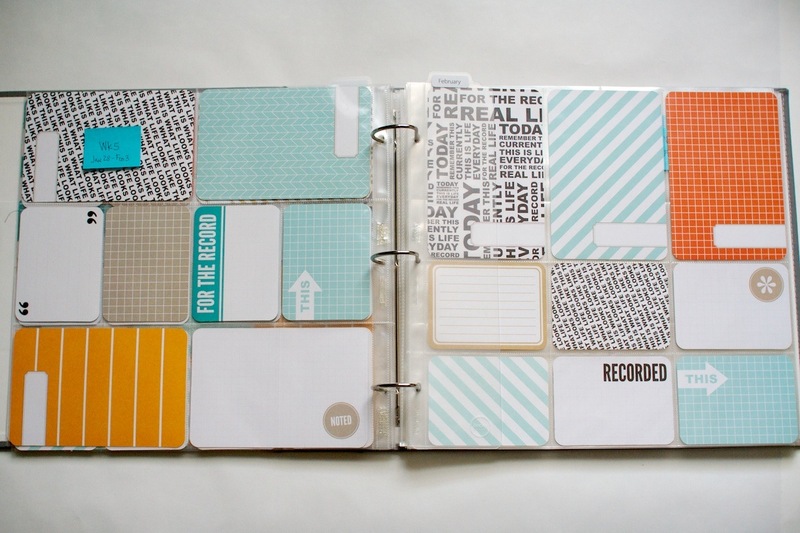 That’s one of the reasons I think it’s become SO popular within the scrapbooking community: because it can really be anything you want. And the truth is I LOVED it. 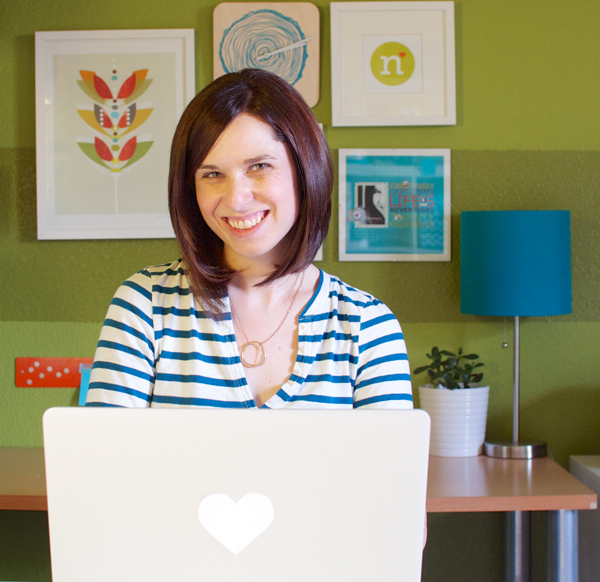 But I had just started Nettio Designs a few months earlier and I felt that as a weekly project, it was just more than I wanted to commit to at that point. My focus needed to be elsewhere. So I put it on the back burner all the while occasionally pulling the album off the shelf to admire that lonely little two-page spread. There’s something about it that just kept calling to me. I don’t know if it’s the larger photos or the the everyday-ness of it but I can’t help but smile every time I look at it. I connect with it in a way I don’t always feel with my digital pages. 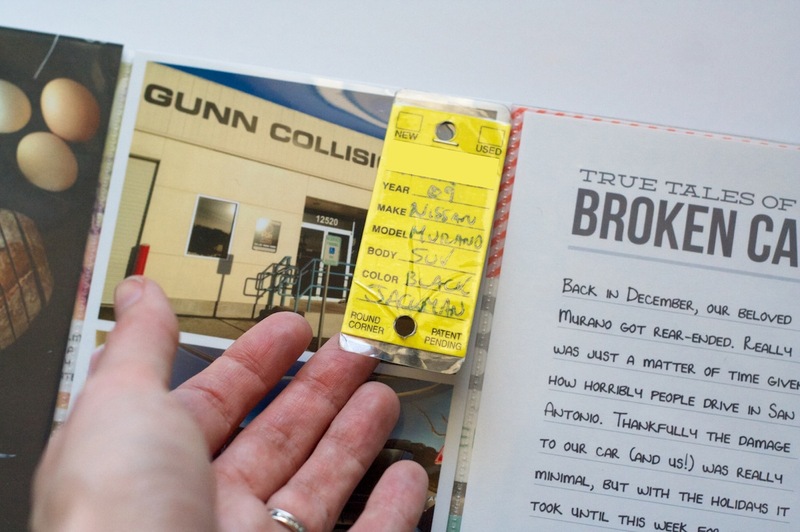 When 2013 started drawing near I started thinking again about Project Life. 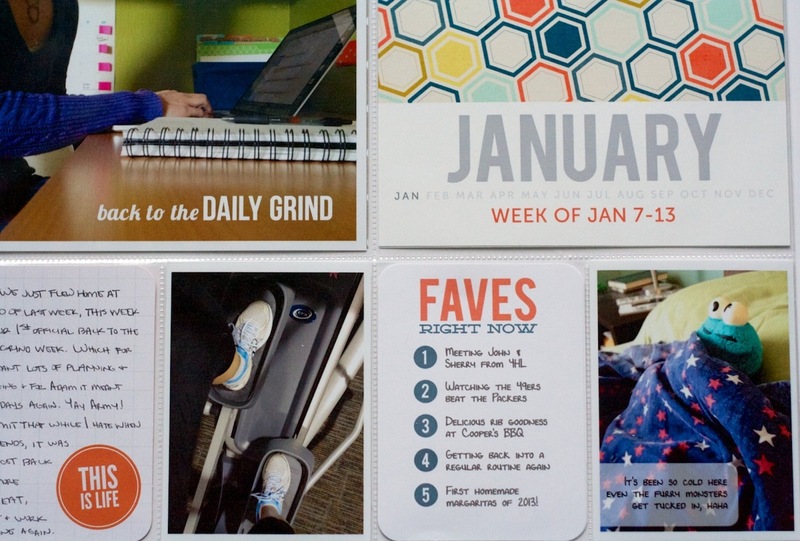 I’d really enjoyed watching Elise’s album take shape this year and the fact that she’s a child-free scrapper as well gave me a bit more confidence that this format could be doable for those of us who don’t have a bunch of kids or pets roaming around. But what really sold me this year was, back in December, I was looking back through all my photos from this past year and I realized there are so many awesome photos and stories that I’d love to capture, but I have no desire to scrap them digitally. 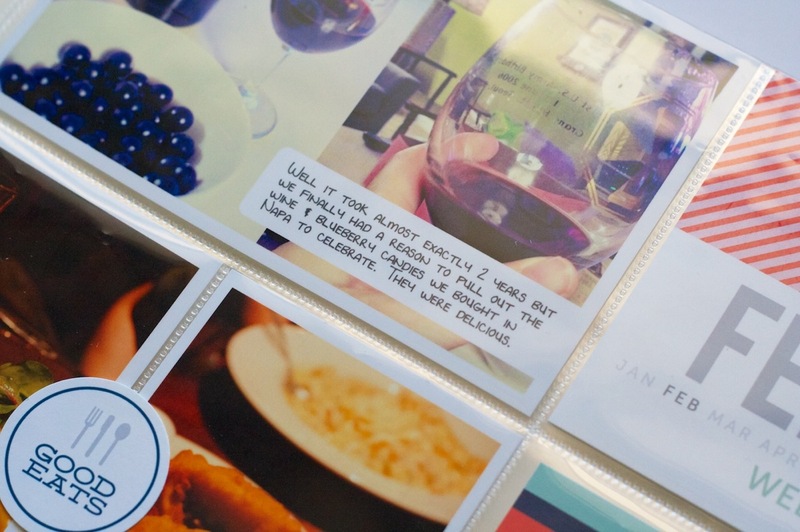 Which is maybe a strange thing for a digital scrapbooker to admit, haha. 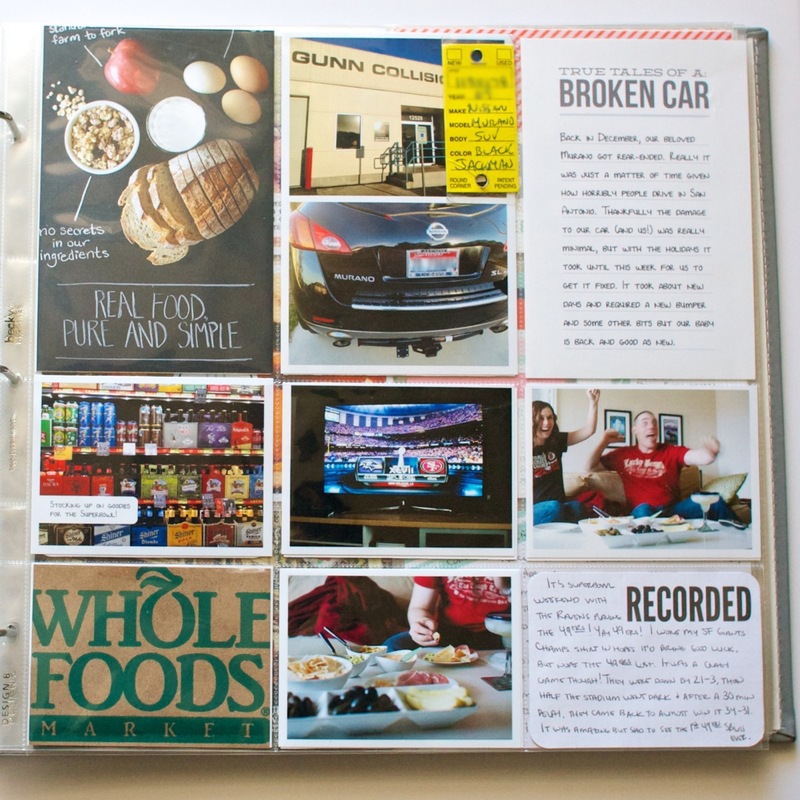 But I’ve always looked at my digital scrapbooking albums more as journals than strict memory keeping. 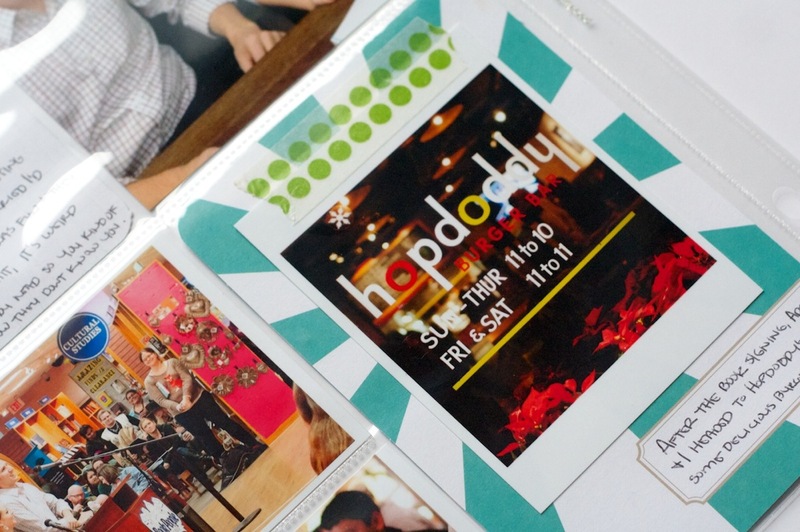 And I’m not sure if it’s partly because I scrap 8×8 which doesn’t leave a ton of room for photos but event scrapbooking has never been my jam. Plus there’s also the problem of memorabilia. 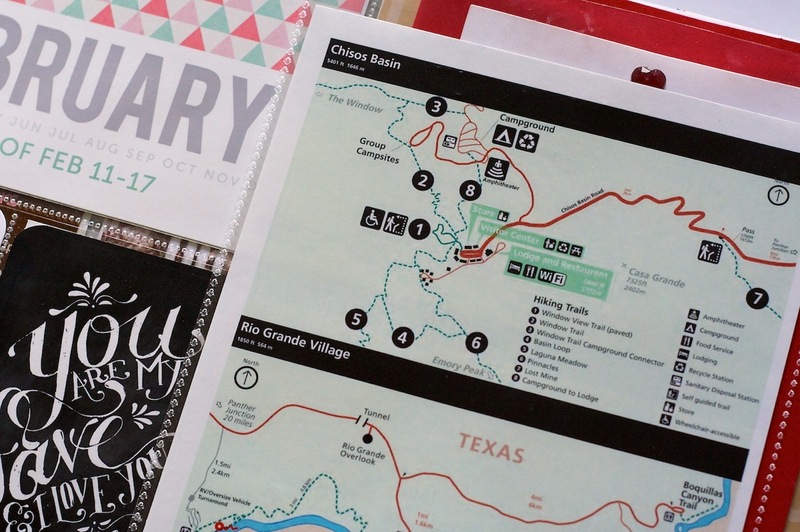 I LOVE collecting bits of paper from the places we go but as a digital scrapbooker, I’m never really sure what to do with them. It’s one of the reasons I love my Holiday Faves album so much – because it gives me a home for all those bits & pieces of life I want to save. So after thinking and debating and thinking some more I took the plunge and ordered the Seafoam core kit when it finally was released earlier this month. I figured since I already owned an album and a bunch of page protectors, I might as well give Project Life another shot. A fully committed and ready shot this time around. And what better way to do that than as one of my Creative Adventures for the year, right? 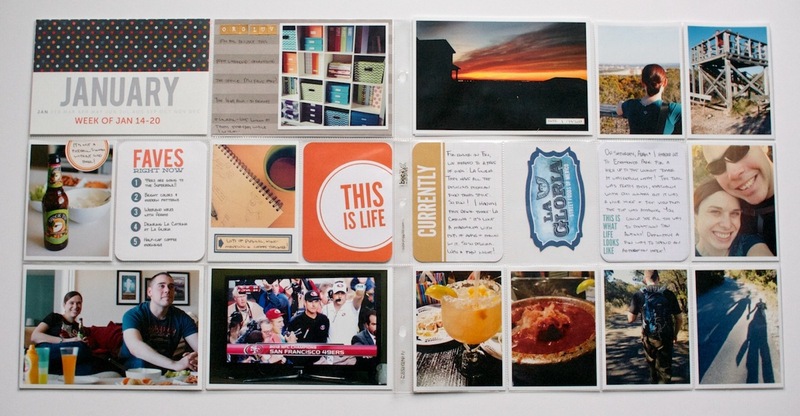 Because I am really really excited about the creative aspect of Project Life. 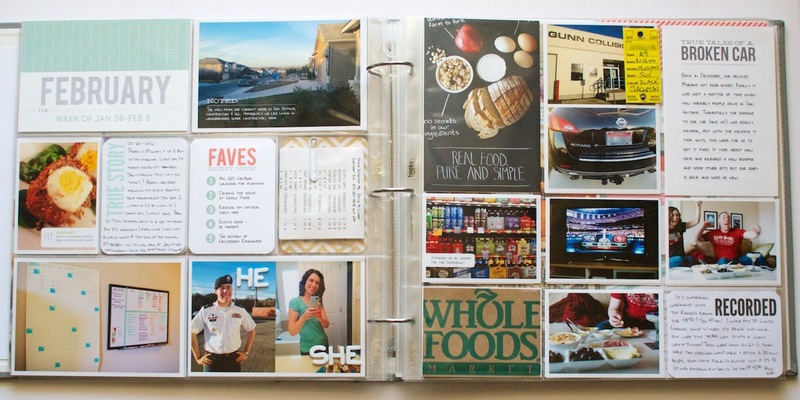 I’m excited for the chance to dabble in hybrid/paper scrapbooking more than just once a year and umm hello, grid-based page design where you give “homes” to all your elements? SO totally my thing. Since I don’t have my first two weeks of Project Life ready to share just yet, I thought I’d share a little bit about my plans and how I went about setting up my album. As I mentioned, I already owned this American Crafts leather album and the Design A and the Photo Pocket Pages Variety Pack 1. 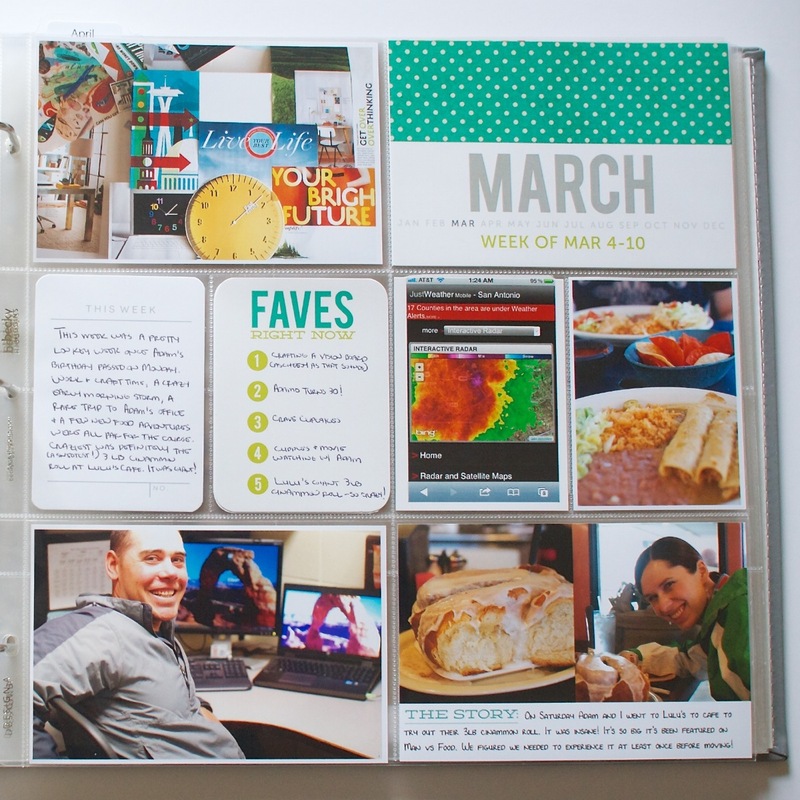 I knew going into this that I wanted to mix up the designs, as opposed to using all of one style for the entire year, but I also knew I wanted there to be a pre-planned method to the madness because I know if I have to decide which page protectors to use each week, this album will never get done. Isn’t this Seafoam kit pretty? I feel like it’s going to mix in really nicely with other products since it’s fairly neutral. The pattern I liked best ended up including a Design A page protector in each spread with one of 3 different designs for the second page: Designs B, D & F (which I think might only come in the variety pack). 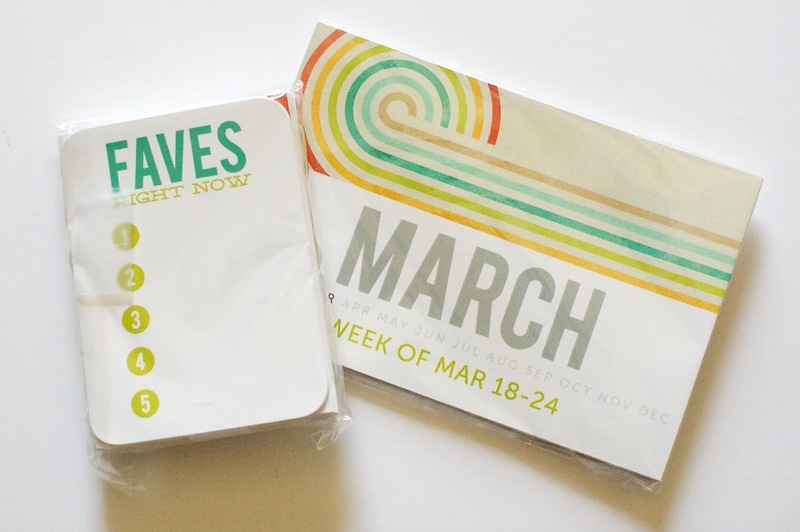 Because of the way the pages work front to back, each two-week period will basically have the same design, just flipped. Which I think will be good since it’ll add consistency to the album but still keep it interesting for me to do it this way. 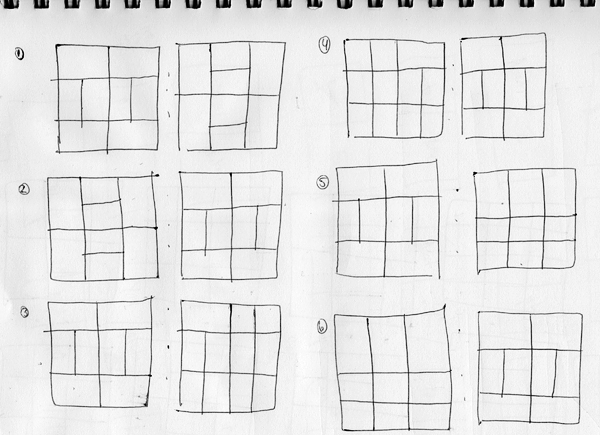 I know from my Project 365 album that if I tried to do only all Design A pages, I’d get bored really fast. Weekly two-page spreads: I debated a lot about this, whether I wanted to commit to a weekly format or whether it would be too much. But I tend to be a creature of habit and so I thought my best chance for making it through the entire year would be to make it a routine. 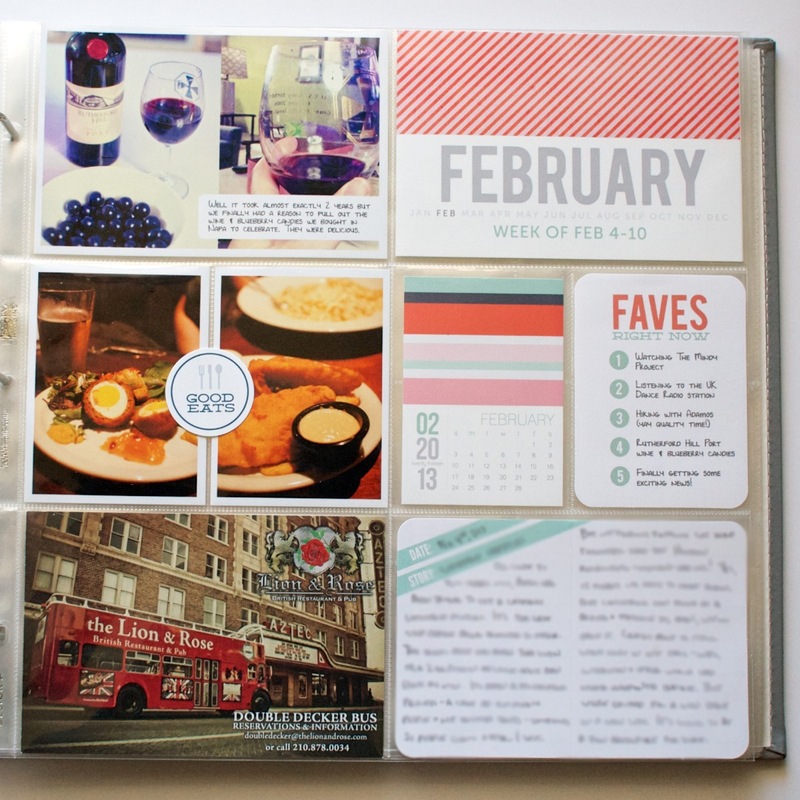 So I’m currently planning to do weekly spreads but share my pages bi-weekly here on the blog. 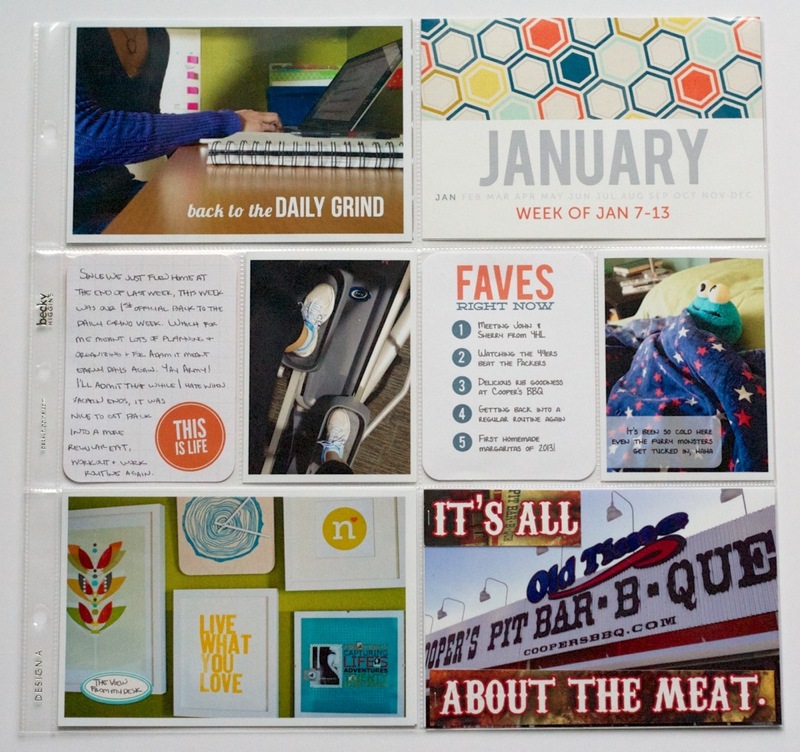 A mix of hybrid/paper: Much like my Holiday Faves mini album, I’ll be using a mix of printed digital elements and pre-made paper elements. I’m sure I’ll end up designing some of my own stuff as well, which should make you fellow Project Lifers happy. A few repeating cards: I’m currently planning to have a consistent title card for each week as well as one or two other items that’ll repeat every week/month. I think it’ll add some consistency to the design while also allowing plenty of room for creativity. That’s what I’m thinking so far anyway – how it’ll pan out over 12 months, who knows! But I’m super super excited about this adventure and I have to say, seeing Adam’s reaction when looking at the week I have completed spread, assures me think I’m on the right track. 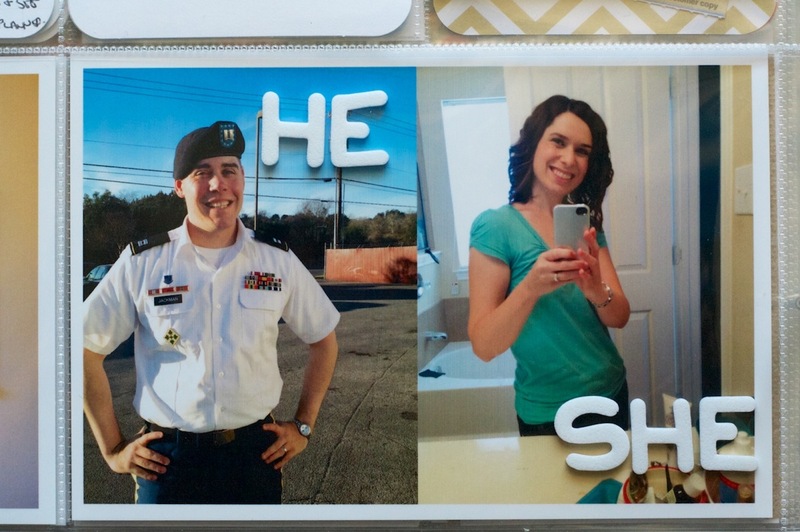 He’s always been supportive of my digital scrapbooking but I just think this format is easier for a non-scrapbooker to “get” than a printed digital page. I’ll be doing a full Project Life update next week so stay tuned for that. Anyone else doing Project Life this year? Have any good tips or tricks to share with me? I’d love to hear them so please share them in the comments below! I’m pretty sure I’m going to need all the help I can get to make it through the entire year, haha. 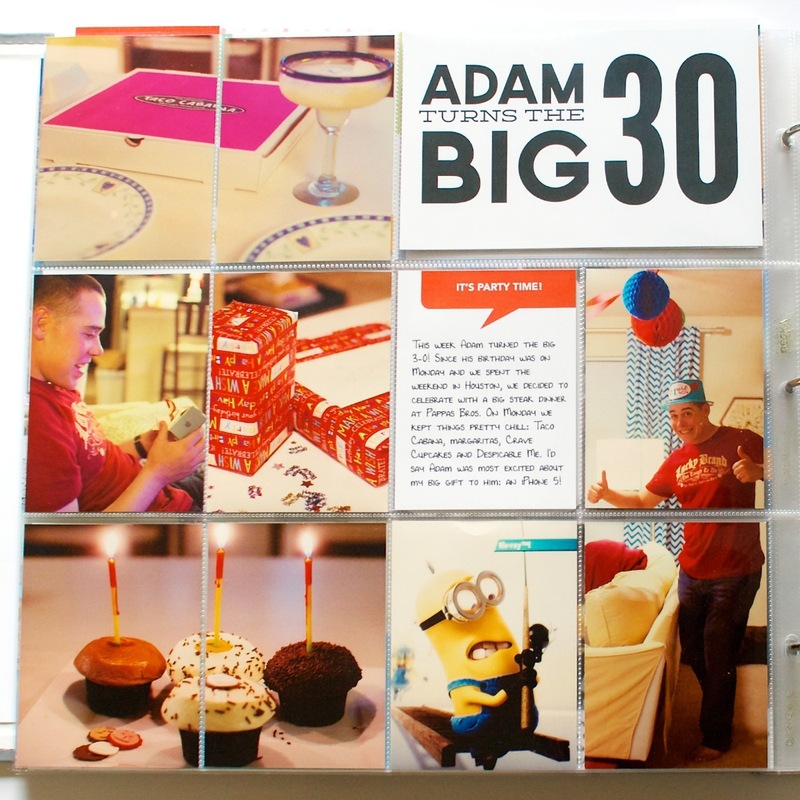 In honor of my 30th birthday, I’m challenging myself to go on 30 creative adventures before the end of 2013. This is Creative Adventure 4 of 30. You can read all the details behind this project here and find links to all my completed adventures here.